Product maintenance. 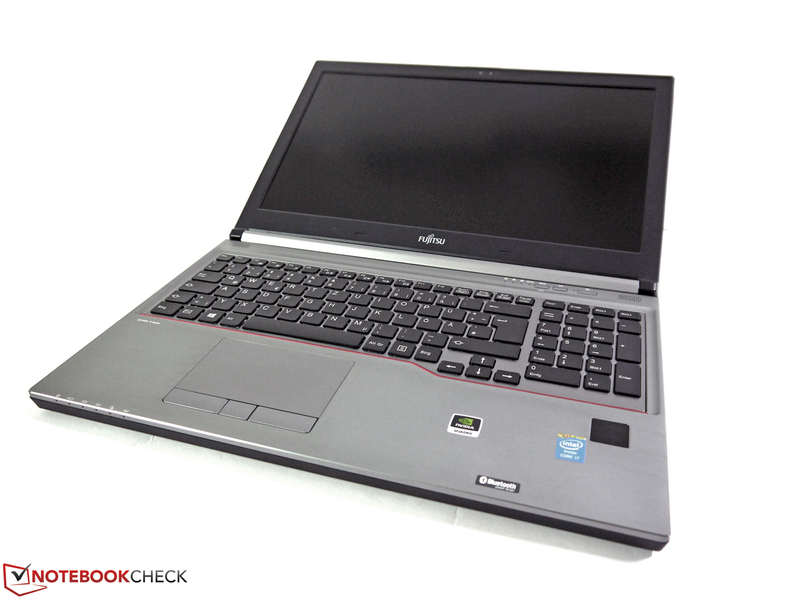 Fujitsu has updated its mobile workstation Celsius H730 for 2015, and improved some aspects. Our in-depth review shows what you can expect in addition to the minor CPU upgrades. While other manufacturers like HP and Dell continue to expand their portfolio of mobile workstations, Fujitsu offers only one model, the Celsius H730. 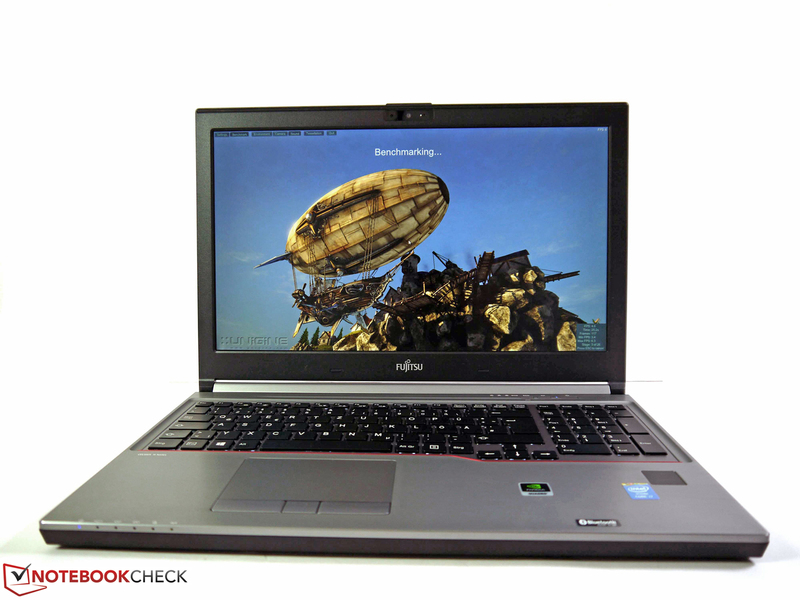 The more powerful 17-inch version, Fujitsu Celsius H920 however, was discontinued last year and did not get a successor. This means you will no longer get very powerful workstations from Fujitsu. 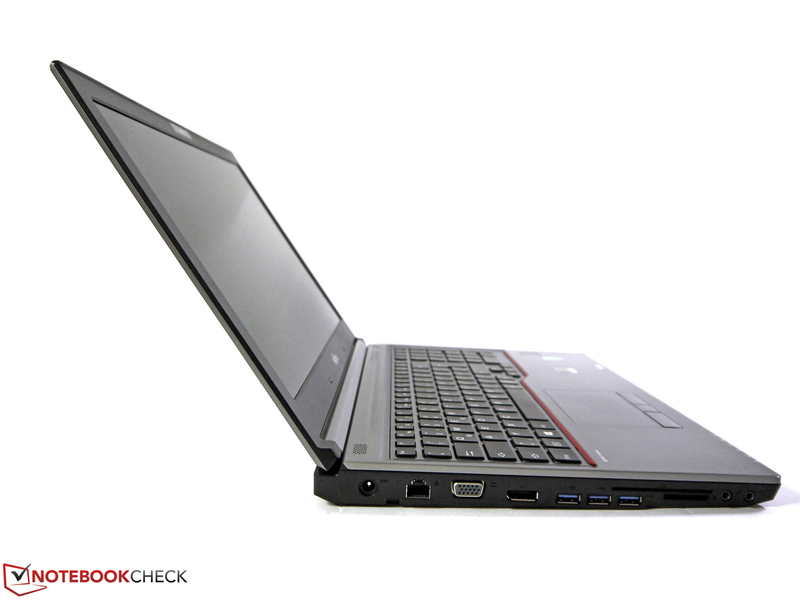 As in any other 15-inch workstation, the cooling concept and the size, limit the Celsius H730. Therefore, high-end GPUs, extreme CPUs or a third storage solution are components that cannot be realized with the Celsius H730. 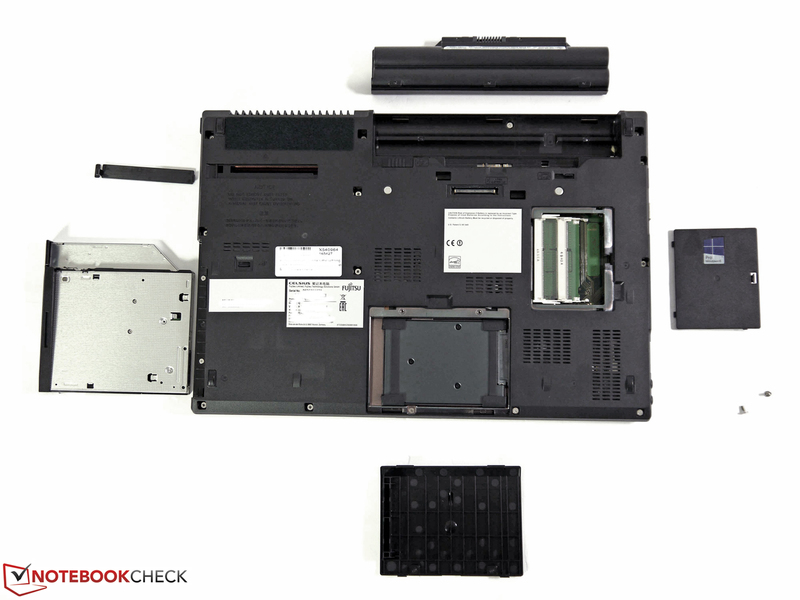 Our review unit is a typical 15-inch configuration with components that are designed for the TDP limitations of a 15-inch chassis. You get an Intel Core i7-4710MQ CPU, 8 GB of RAM, a 256 GB SSD, Nvidia's Quadro K1100M GPU, a Full HD display and a UMTS module. Currently, the price of the review configuration starts at around 1600 Euros (~$1807). 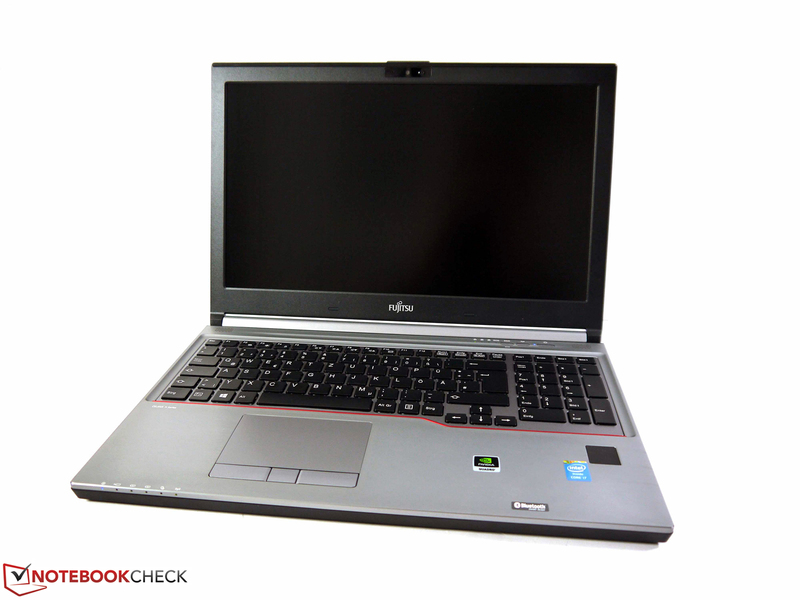 Fujitsu uses a construction with a comparatively slim design, even though it cannot keep up with slim workstations that are currently very popular. 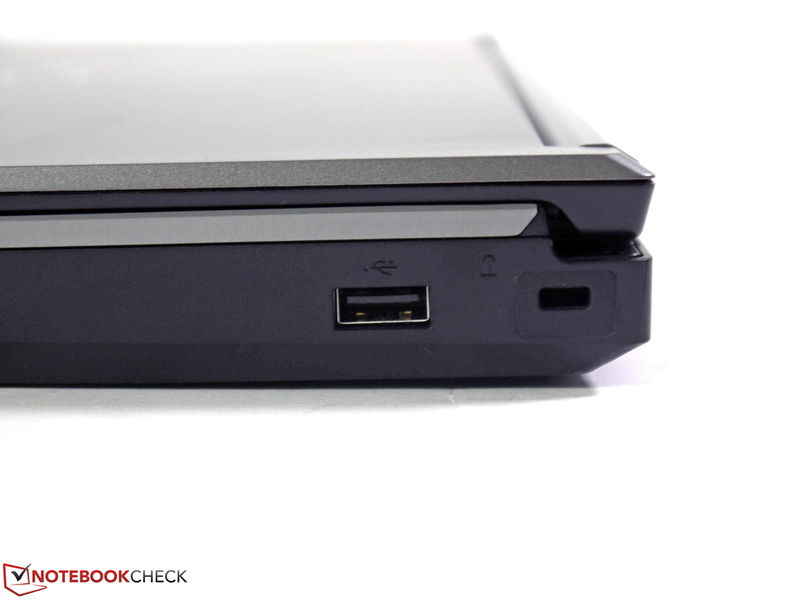 These devices sometimes are under 2 kg (~4.4 lb), and have very slim case designs that are similar to Ultrabooks. 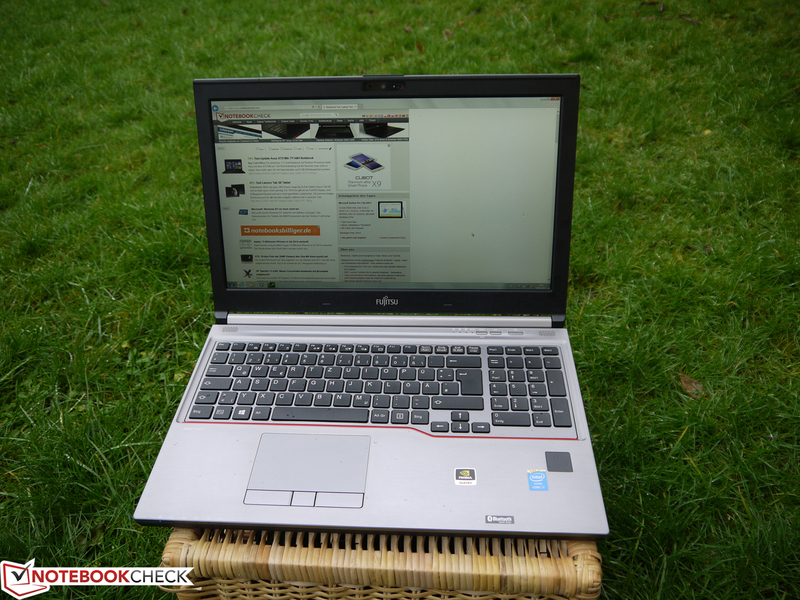 This obviously also means there are some disadvantages that do not concern users of the Fujitsu Celsius H730. Our review unit has a classic modular multi-bay, a docking port, as well as a comprehensive port variety. 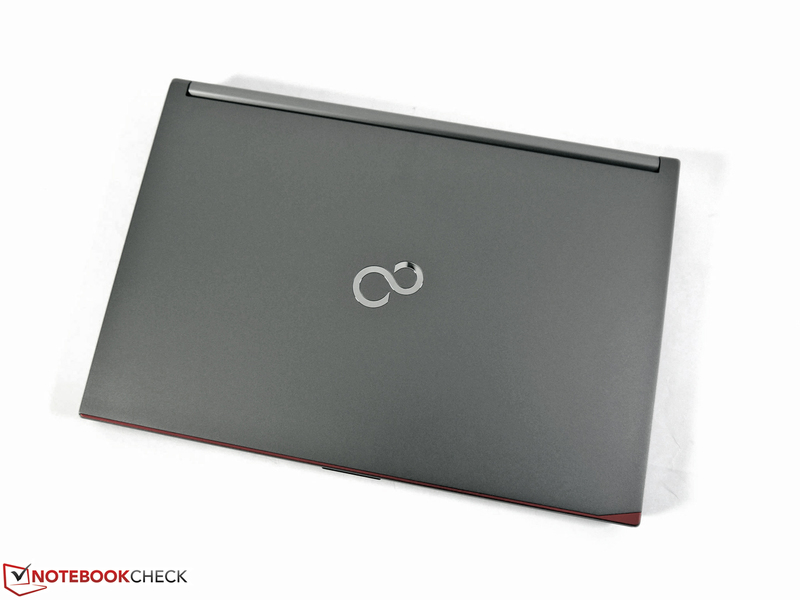 This means the device is primarily designed for traditional workstation users that require a functional notebook. Fujitsu has improved the stability of the case compared to the predecessor, Fujitsu Celsius H720. 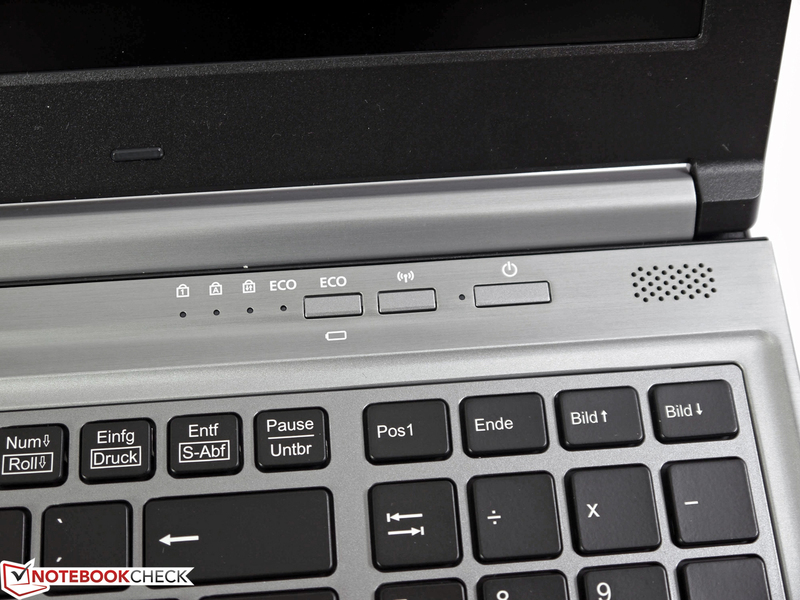 The area around the keyboard with a brushed finish, looks more sophisticated than the plastic of the Fujitsu Celsius H720. There is hardly any bouncing from the display hinge, and the palm rest is very sturdy, even around the multi-bay area. The support feet are higher than the felt pad at the bottom, which means the Fujitsu Celsius H730 does not wobble on the table. The excellent integration of the battery has not changed; it still sits firm and flush in the designed recess. The light-weight magnesium lid is still quite flexible and can be easily twisted with not that much force. However, we could not provoke picture distortions on the panel during our tests, and the display seems to be sturdy enough. The weight of our review configuration is 2.83 kg (~6.2 lb), and therefore average compared to typical rivals. 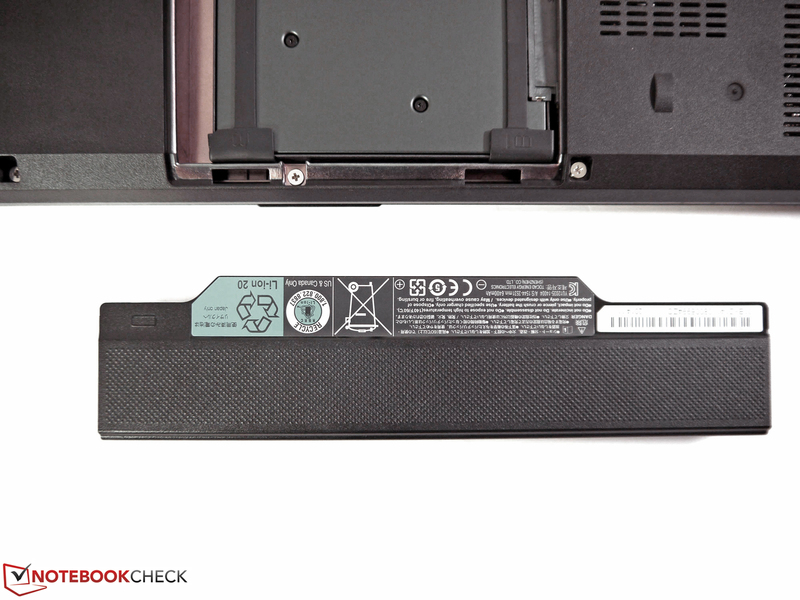 Lenovo's ThinkPad W540 is a few hundred grams lighter, while HP's ZBook 15 G2 scratches the 3 kg (~6.6 lb) mark. ... and generally convinces with a good quality. 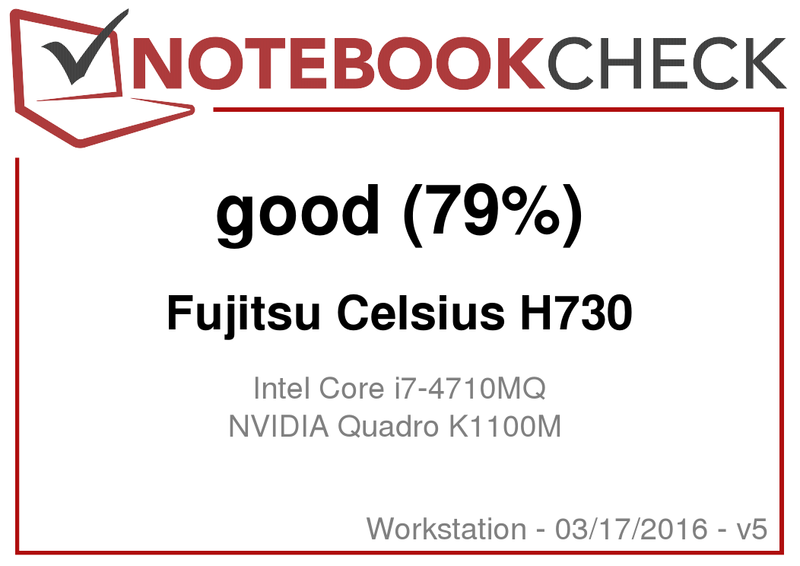 The Fujitsu Celsius H730 has a solid, but not exceptional port variety. External displays can be attached via VGA as well as DisplayPort and fast storage solutions via three USB 3.0 ports. 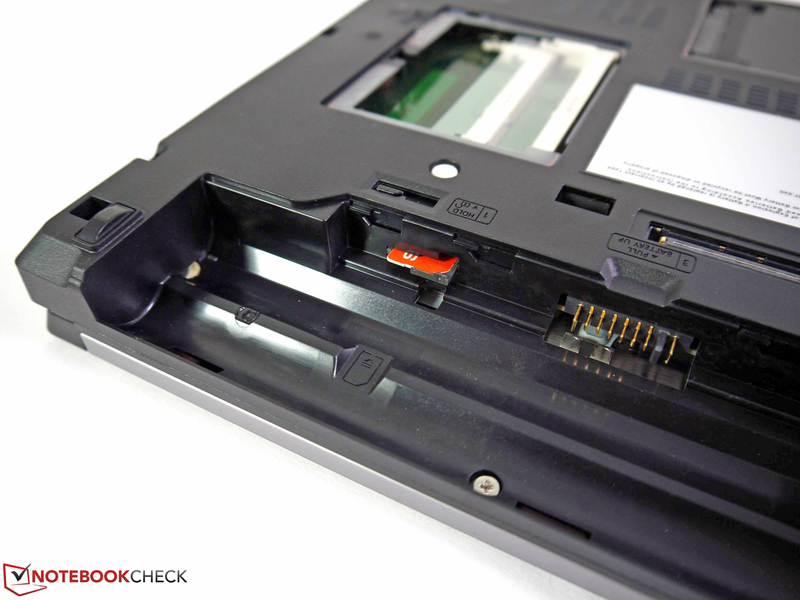 However, you will have to live without the rarely used ExpressCard extension and some other current standards. 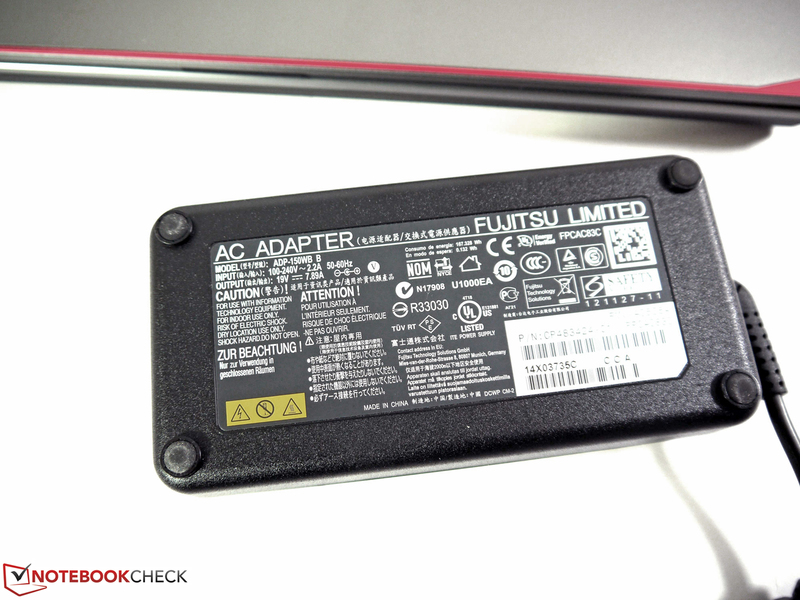 Fujitsu has not included an internal PCIe port (M.2) or Thunderbolt 2 for external devices. The port layout could have been improved as well, the left side in particular is very crowded when you want to attach peripherals directly into the notebook. 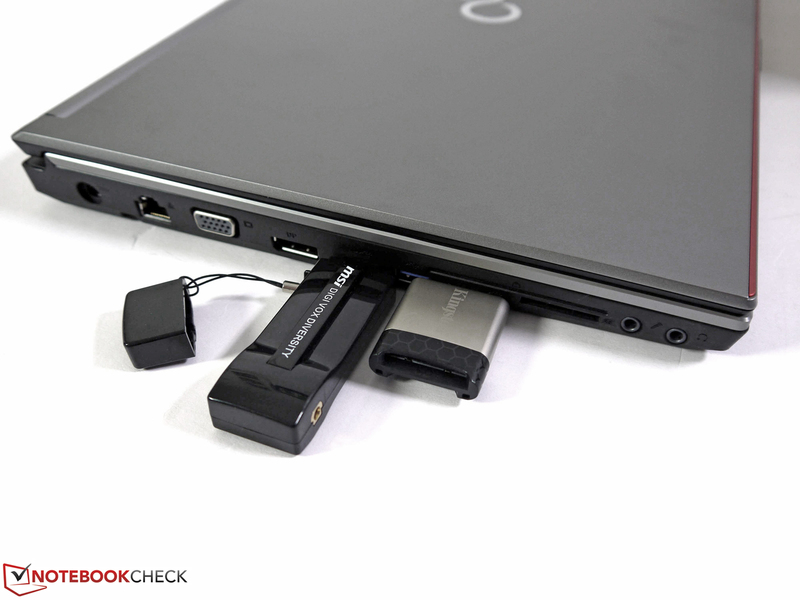 The speed of the ports is on par with up to 195 MB/S via USB 3.0 and 88 MB/s via UHS-I card reader. One appreciated feature is the integrated modular multi-bay. 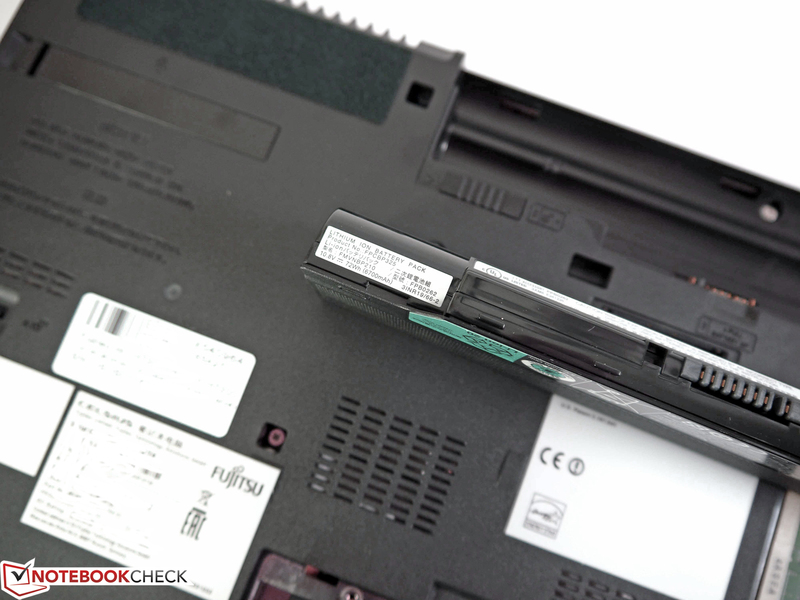 In addition to the modules for common hard drives or to reduce weight, Fujitsu also offers a corresponding additional battery to improve the battery runtimes. While you can actually equip the Fujitsu Celsius H730 with a fast LTE modem, you are limited to the choice of WLAN adaptors with support for the 802.11n standard. 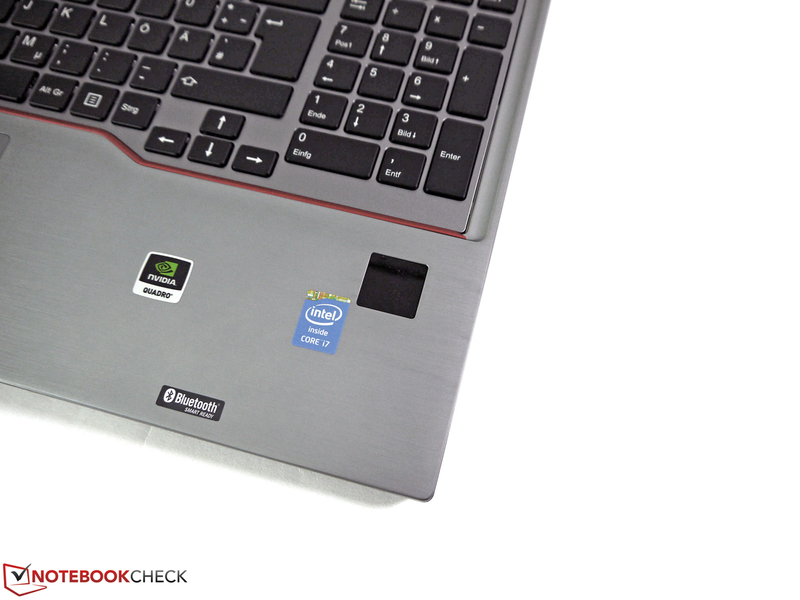 Our review unit uses the Intel Wireless-N 7260 a/b/g/n. A faster module that supports the 802.11ac standard with theoretical transfer rates of up to 1300 Mbps in 5 GHz networks is currently not available in Fujitsu's configurations. We measured transfer rates between 8.2 MB/s and 1.8 MB/s at different distances and with obstacles to the AVM Fritz!Box 7490. The review unit is equipped with a UMTS modem (Sierra Wireless AirPrime) for the mobile Internet access. 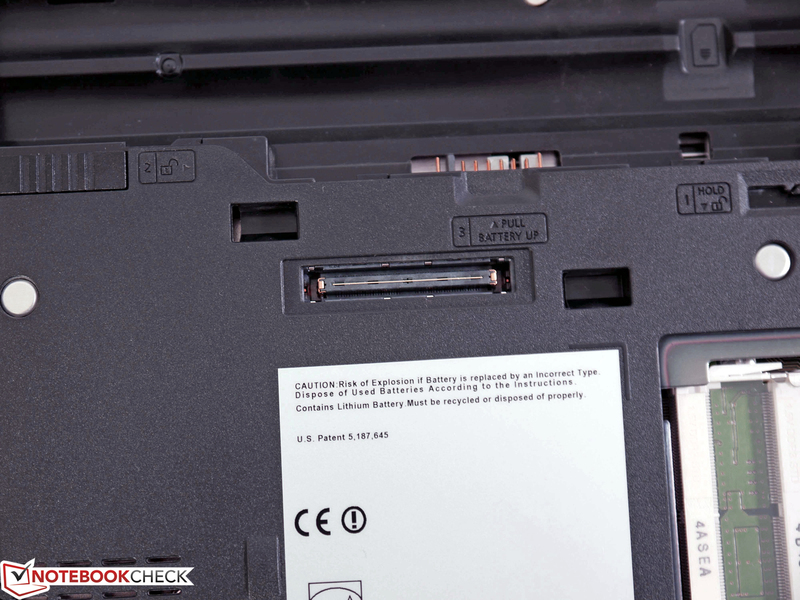 The corresponding SIM card slot is in the battery tray. We have already mentioned that LTE is available as an option (Sierra Wireless AirPrime EM7305 LTE/HSPA+) and it should increase the transfer rates significantly with the corresponding network. The list of connectivity features is completed by Gigabit LAN, Bluetooth 4.0, a 1 MP webcam as well as two digital array microphones. Fingerprint reader, SmartCard reader, Computrace service, Anti Theft, and a Trusted Platform Module (TPM 1.2) complement the standard password and software protections, so the Fujitsu Celsius H730 is on par with the usual business devices and provides numerous solutions to protect your data against theft. Of course, a Kensington Lock, using a corresponding cable lock for theft protection is available. The maintenance hatches for the most important components are located on the bottom. Replacing the 2.5-inch solid-state drive is a quick process, the same as equipping the empty memory slots with additional RAM modules. A long-standing tradition of Celsius workstations is a separate opening for optional filter modules, so the cooling solution is protected against dust or other foreign objects. Accessing the other components is reserved for authorized service personnel. This means you should think hard about the correct and future-proof configuration selections when you buy the device. Using the available modules for the multi-bay on the other hand, is not a problem. Fujitsu does not offer pre-configured models with SSDs or HDDs at the moment, but you can find a module for your own 2.5-inch drives (S26391-F1334-L600, around 40 Euros; ~$45) when you browse the list of accessories. Fujitsu also offers a Blu-ray drive (S26391-F1334-L300, around 150 Euros; ~$169), an empty module (to save weight, S26391-F1334-L100, around 20 Euros (~$23), or a secondary battery (S26391-F1334-L500, around 150 Euros; ~$169). It seems that the battery is available with 28 Wh or 41 Wh, but the product number is identical. 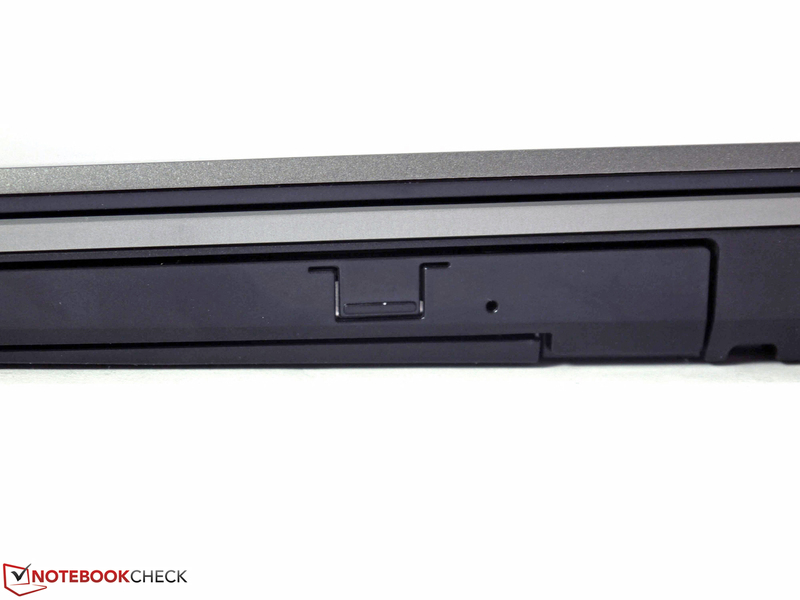 The docking port at the bottom can be used with Fujitsu's port replicators from the LifeBook E-series (S26391-F1337-L110, around 120 Euros; ~$136). 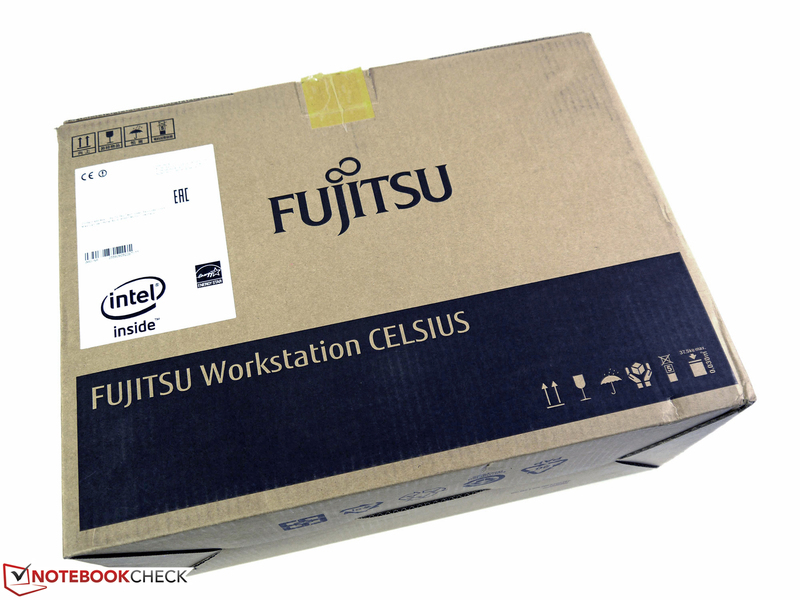 Fujitsu offers a manufacturer's warranty of three years, which is typical for workstations. This time can be extended or expanded with additional services at a cost. The support pack with a five-year on-site service on the next business day (FSP:GA5S20Z00DEW01), for example, is available at 420 Euros (~$474). Edit 01/30/2015: We asked Fujitsu for some additional information on the warranty and the vent opening, and got the following response. "There are no CRU numbers in our spare part lists. The customer is asked on the phone whether he wants/can replace the corresponding component by himself. If that is the case we will ship the part to him, otherwise we will trigger the corresponding service and a technician will take care of the problem on-site." "The customer can certainly upgrade the system. It is not necessary to call the hotline, but advisable and recommended to get at least the correct information about the components. 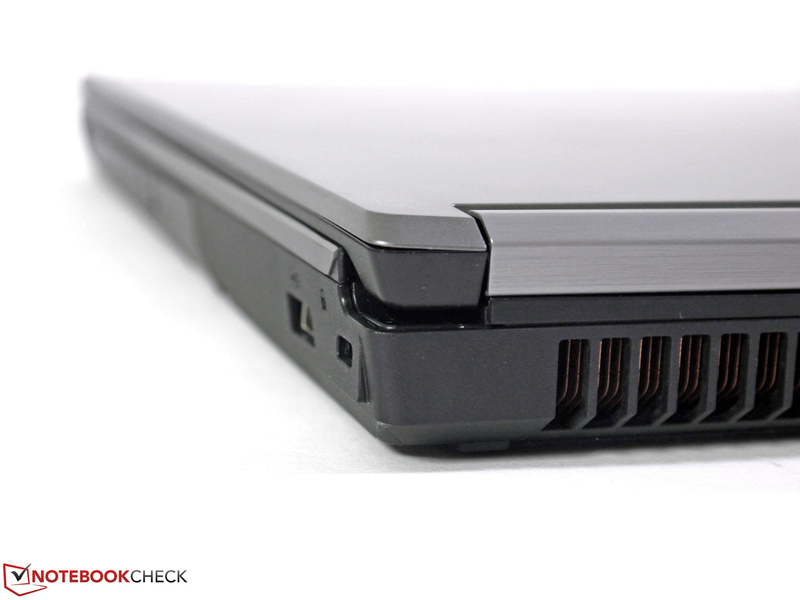 However, a proper upgrade does NOT result in a void warranty." "In case of damage, the technicians will check whether the problem was caused by improper handling during the replacement/integration/upgrade process." "The customer does not require special filter modules. The cover is only designed to improve the process of removing possible dust from the case. It is collected in front of the fins of the cooling sink and can block them, preventing the optimal cooling performance. 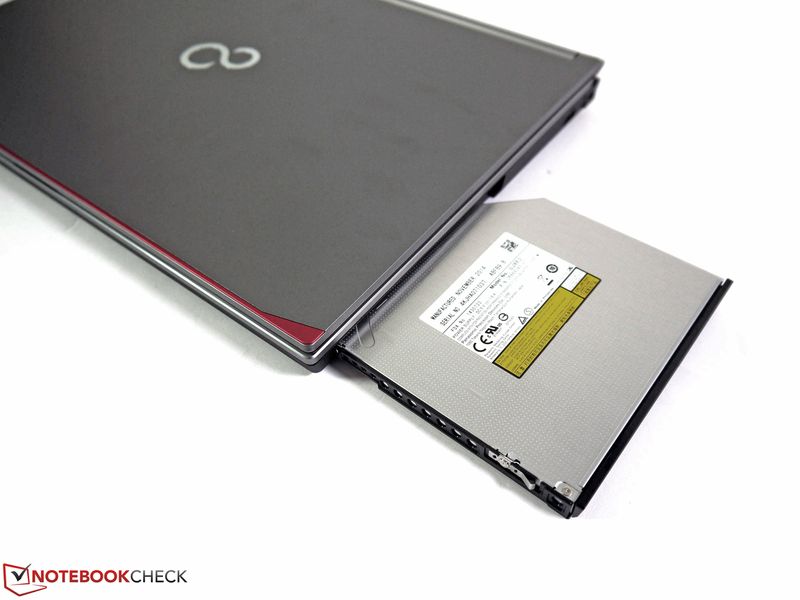 The user can easily remove the dust when he opens the cover to restore the full cooling performance. 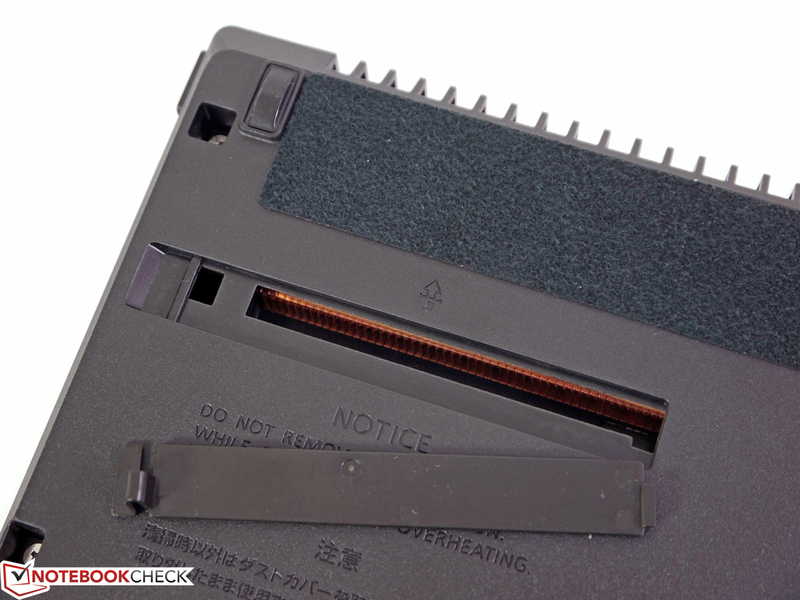 Without this "inspection flap" you would have to disassemble the whole system to remove the dust, which would be quite impractical." 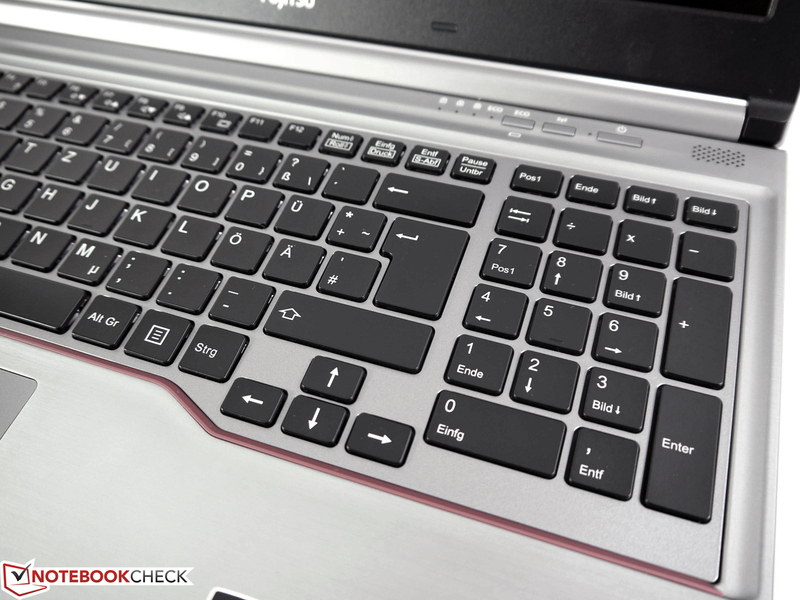 Large keyboards with separate numeric keypads are quite the standard for business notebooks by now, and the same applies to the Fujitsu Celsius H730. You get a total of 83 + 21 keys with a size of 19 mm (~0.75 in) that occupy almost the entire width of the case. The separate numeric keypad is an advantage particularly when you work with large rows of numbers. 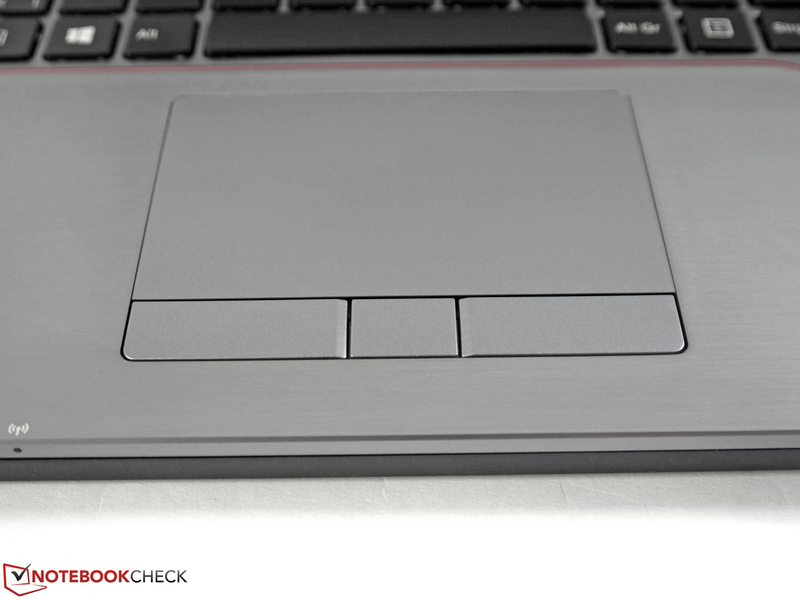 This also means the touchpad is shifted to the left side to keep the central position underneath the space bar. Not every user will like the asymmetrical layout, and it will take some time to get used to. Users of the old Fujitsu Celsius H710 (conventional keyboard) could have some problem at first. Overall, the quality of the input, which now uses a chiclet design, is very good. 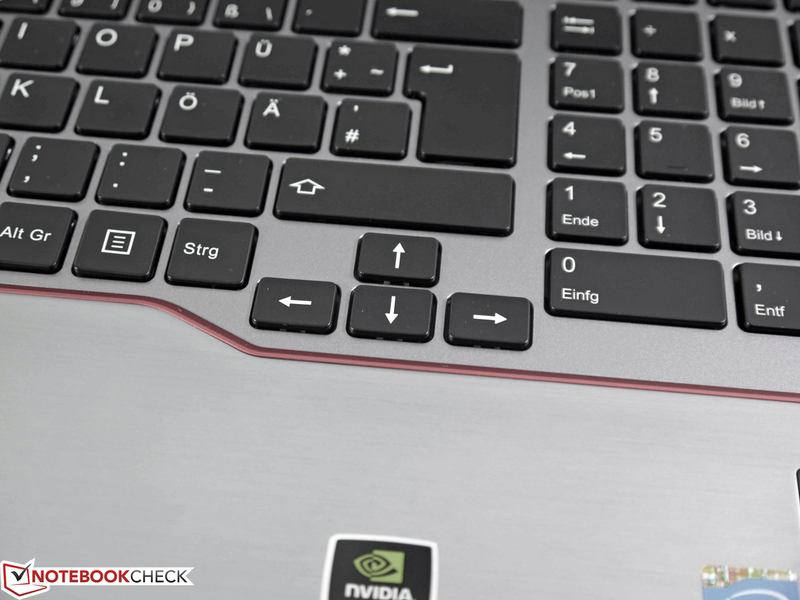 The keyboard support is very firm and there is just some slight bouncing on the left edge in the area around the Tab key. With a medium to short travel and a smooth and quiet stroke, the characteristics of the input differ from that of the Celsius H720, but overall, it is still suitable for prolific writers. 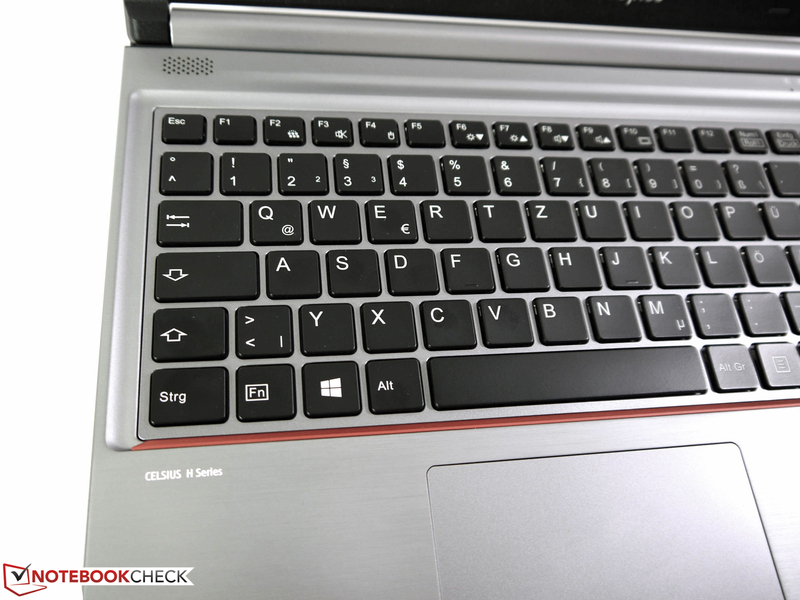 The integrated keyboard illumination can be activated and deactivated via FN combination and adjusted in two steps. The touchpad area is rather large at 98 x 60 millimeters (~3.8 x 2.4 in), so you have a lot of space to navigate and execute multiple finger gestures. The gliding capabilities are good and the dedicated buttons execute inputs very well. According to the spec sheet there is also an optional TouchStick for the Celsius H730, but the previous implementation (in the Celsius H720) was not well received because of the poor precision and the lack of dedicated TouchStick buttons. Our review unit was not equipped with this additional input device. Potential buyers of the Fujitsu Celsius H730 cannot choose between different options for the display: According to the spec sheet and the available price lists, you always get a Full HD panel with 1920x1080 pixels. 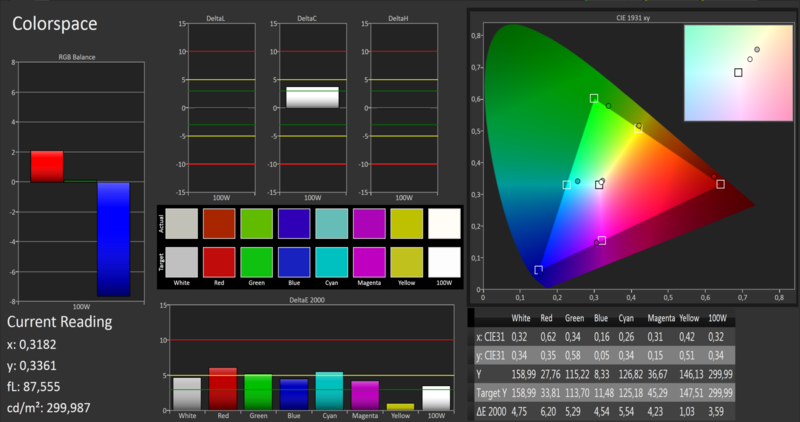 Higher-resolution panels, touchscreens or panels with a very wide color gamut are not available. This is not necessarily a bad thing, since the resolution is a good compromise between screen estate, size and sharpness with a 15.6-inch panel. This solution should meet the requirements of many users and scenarios. The other display qualities will be the deciding factor, which is why we will evaluate them in the next section. As with the Fujitsu Celsius H720, fortunately the manufacturer has played it safe once again with the brightness value in the spec sheet. Instead of the specified 220 cd/m², we were able to measure 281 cd/m² on average across nine measuring spots. LG Philips even lists 300 cd/m² for the AH-IPS display, which is confirmed by our measurements for the upper third of the panel. Unfortunately, this luminance cannot be maintained over the whole area and drops down to 238 cd/m², depending on the spot. This results in a mediocre brightness distribution of 77%, which is also visible to the human eye when looking at single-color contents. You can adjust the brightness in 11 steps. The minimum luminance is 13 cd/m² and is not too high for very dark environments. A separate function key to deactivate the panel is not available. 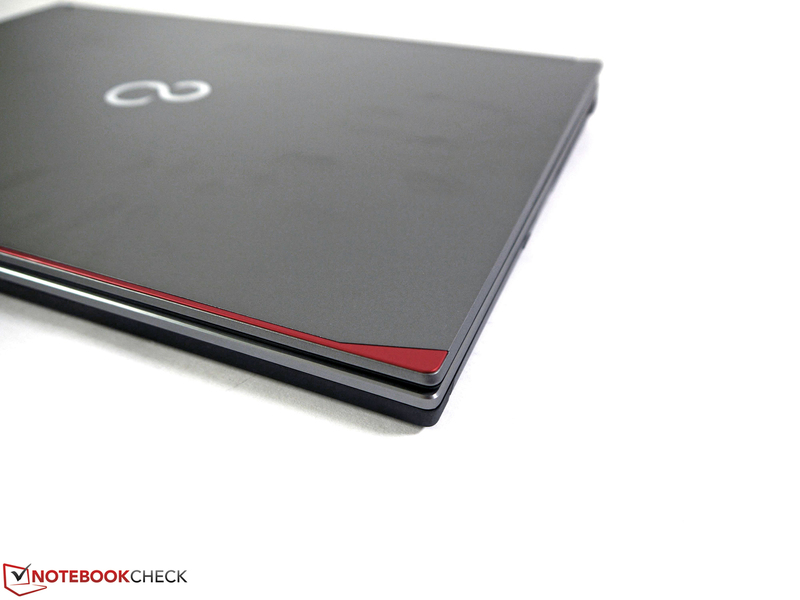 Thanks to the matte surface, you can use more ergonomic brightness settings compared to their glossy counterparts, where you usually tend to use a higher setting to compensate reflections. We can measure a brightness of 151 cd/m² with step 7, which is sufficient for many scenarios and we also use it for our WLAN and video playback battery runtime tests. 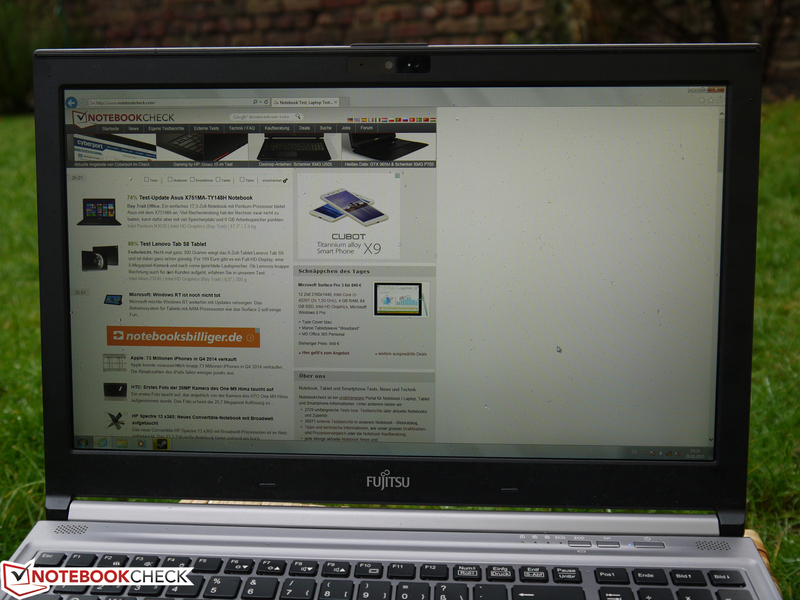 The Fujitsu Celsius H730 does not have a brightness sensor that automatically adjusts the display brightness. The maximum luminance combined with an adjusted orientation is sufficient for comfortable working in the outdoors. The matte surface in particular, is a great advantage in preventing reflections. 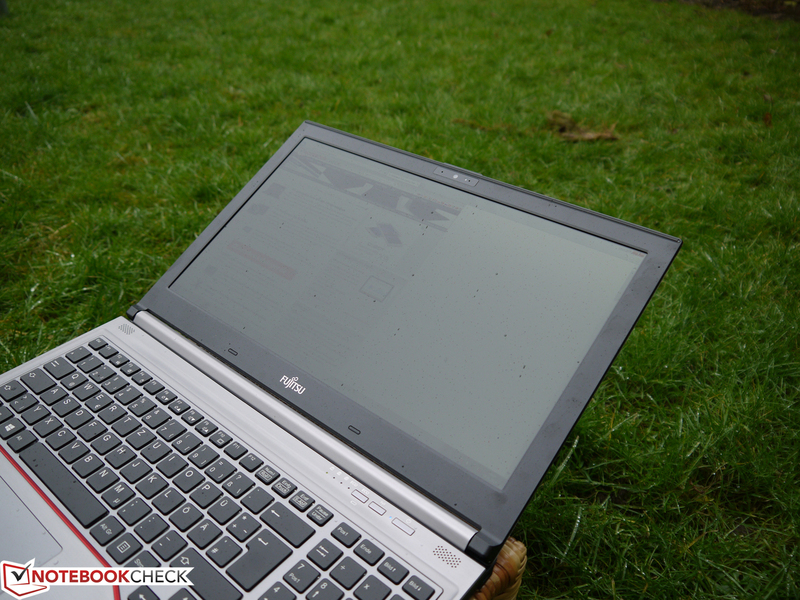 Like many other notebooks, the visibility suffers under direct sunlight and it gets difficult to work with the device. The display brightness is not limited on battery power. The measured contrast ratio of 861:1 confirms the subjectively good black value. Thanks to the rich black, you get a vivid and authentic picture when you look at pictures, watch videos or play games. 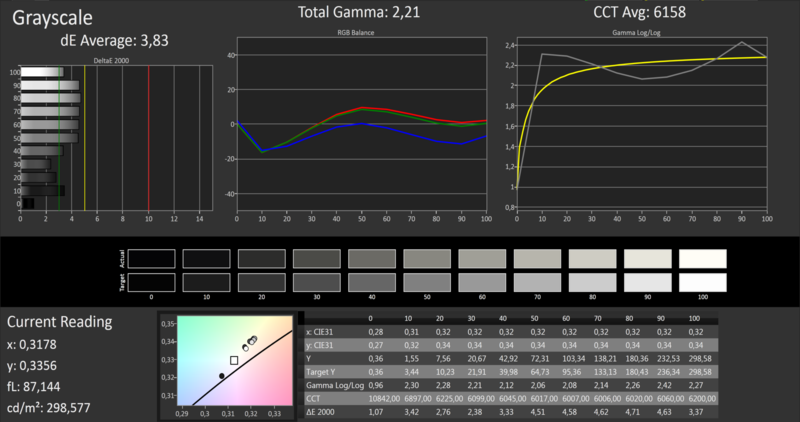 On the other hand, the supported color space is limited at just 66% sRGB. This result is usually not sufficient for professional tasks like picture or video editing. If you can still live with this, you are getting a well-calibrated model. The quite decent readings at the factory settings can be improved significantly with calibration and result in an almost perfect RGB balance, a good gamma curve and a very exact grayscale. The maximum DeltaE 2000 deviations from the ideal values for the colors are 5, which means that it should just be sufficient for professional tasks. 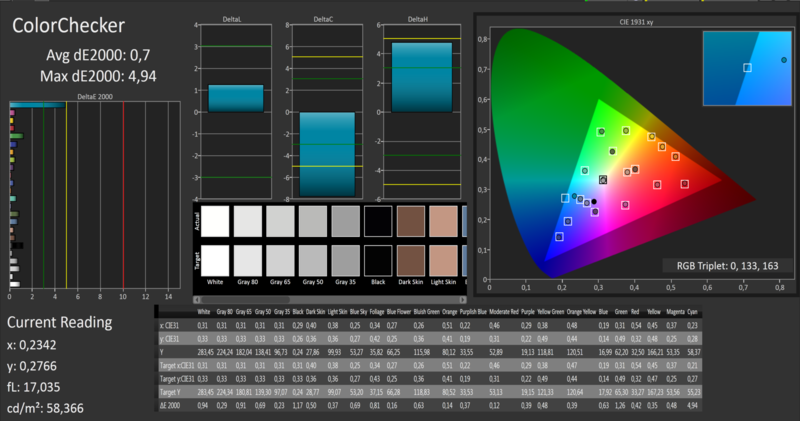 The supported color space is just too small to provide more accurate colors. The comparatively small color space is compensated for by good ColorChecker results for an average DeltaE 2000 deviation of 0.7. 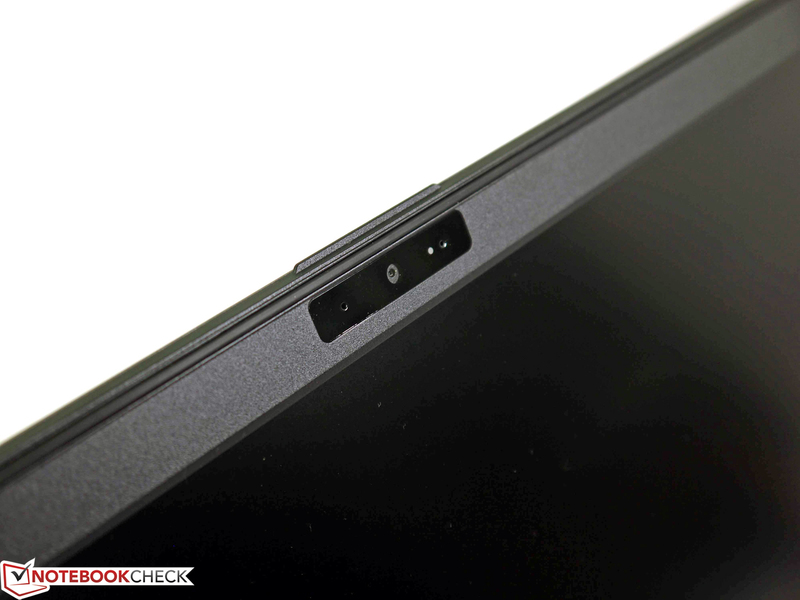 The viewing angle stability of the AH-IPS display leaves mixed impressions and the overall performance is not perfect. The basic presentation in terms of colors and visibility is – similar to other displays with wide viewing angles – good or even very good from all sides. However, with vertical shifts of the viewing position the LG Philips panel suffers from visible brightness changes in a small angle. The perfect viewing position is therefore limited to an unnecessary small area. According to the spec sheet, Fujitsu offers many different components for its Celsius H730: Ten processors, three graphics chips and nine different hard drives/SSDs. 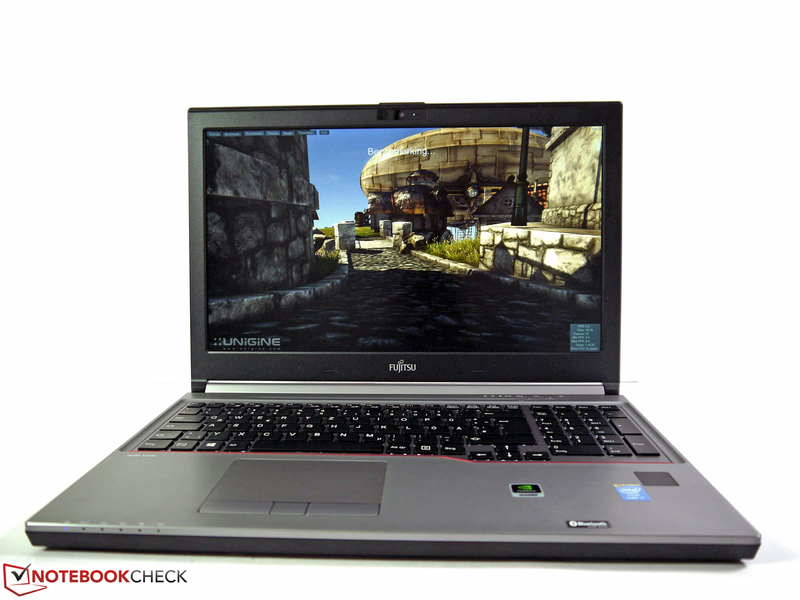 The most powerful combination is an Intel Core i7-4910MQ CPU with Nvidia's Quadro K2100M GPU. Even more powerful components are not available because of the limited cooling capabilities of the 15-inch construction. Our review unit roughly represents the mid-range configuration. 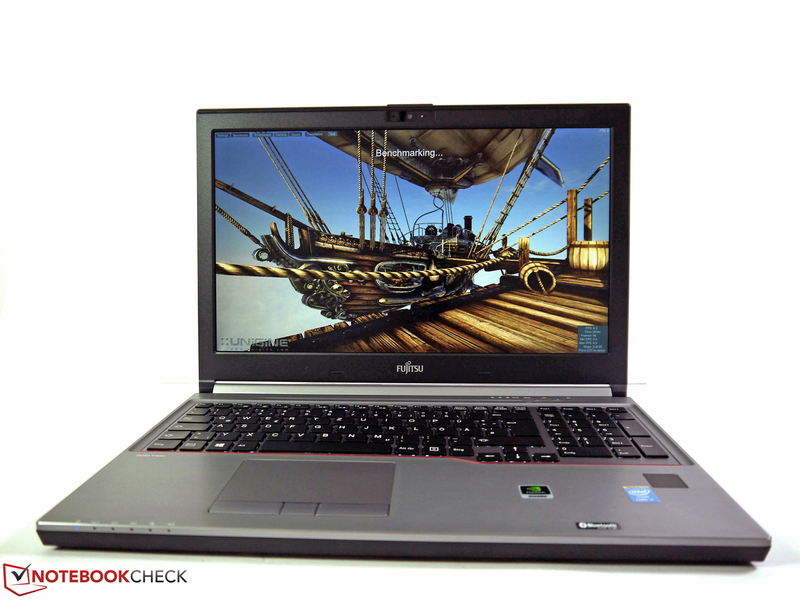 Intel Core i7-4710MQ, Nvidia Quadro K1100M, 256 GB SSD from Samsung and 8 GB of memory indicate a well-balanced working performance for a price of around 1600 Euros (~$1807). 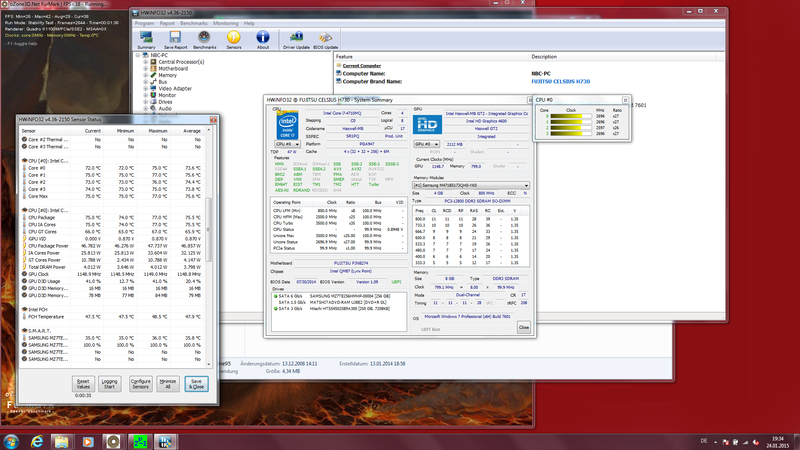 Our review configuration uses the "bread and butter CPU" Intel Core i7-4710MQ. It offers a very good compromise between the price, multi-core and single-core performance. The technical specifications are a clock of up to 3.5 GHz (Turbo Boost), four cores (up to eight threads) and a 6 MB L3 cache with a TDP of 47 Watts. As well as the very good practical impressions during the tests, the benchmark results also allow us to compare the processor with many other models in our comprehensive CPU benchmark list. 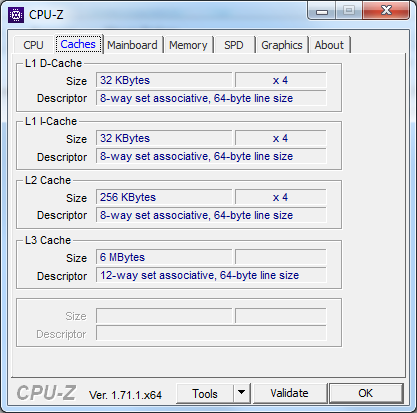 Cinebench R15, for example, determines 134 points (Single-Thread) and 600 points (Multi-Thread) for the quad-core chip. Our device finished the SuperPi calculation 32M (Single-Thread) in 567 seconds and the wPrime1024 calculation (Multi-Thread) in 259 seconds. The results are on the expected level for the Intel Core i7-4710MQ, and therefore roughly on par with the direct successor Intel Core i7-4700MQ. 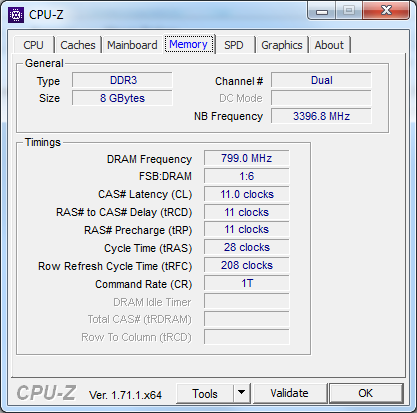 Continuous load for more than two hours results in a processor clock of 2.6 to 2.7 GHz. 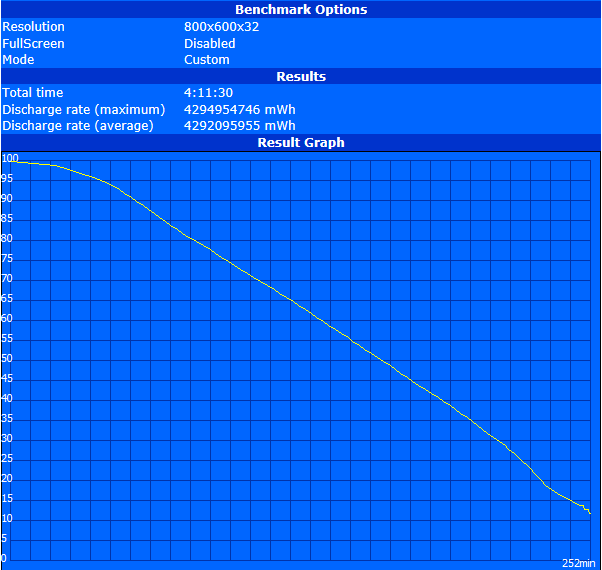 However, compromises have to be made in terms of power consumption on battery power. 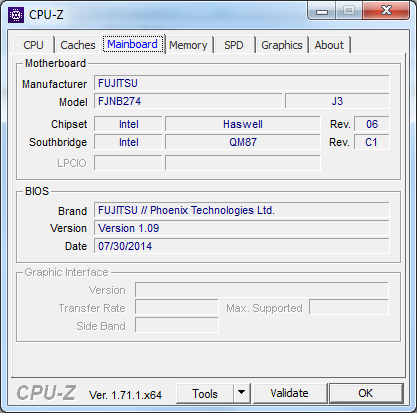 Fujitsu is quite aggressive and throttles the processor to 800 MHz. For example, Cinebench R15 (Multi) only determines 162 instead of 600 points in this scenario, which is around a quarter of the actual performance. The system performance does not reveal any weaknesses or bottlenecks. 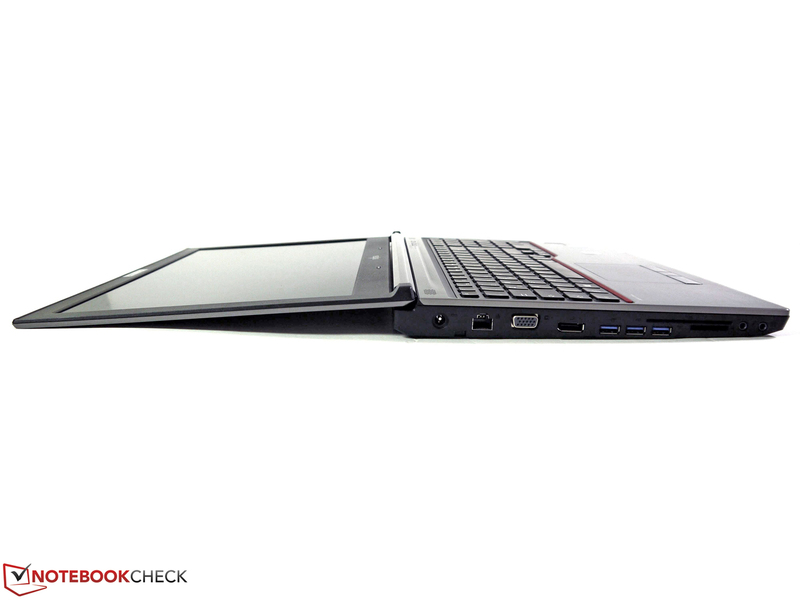 The integrated 8 GB of RAM work in a dual-channel configuration and can utilize their full performance. There are two more empty slots, so it is easy to expand the memory to 24 GB, or even up to 32 GB if you replace the existing 4 GB modules. 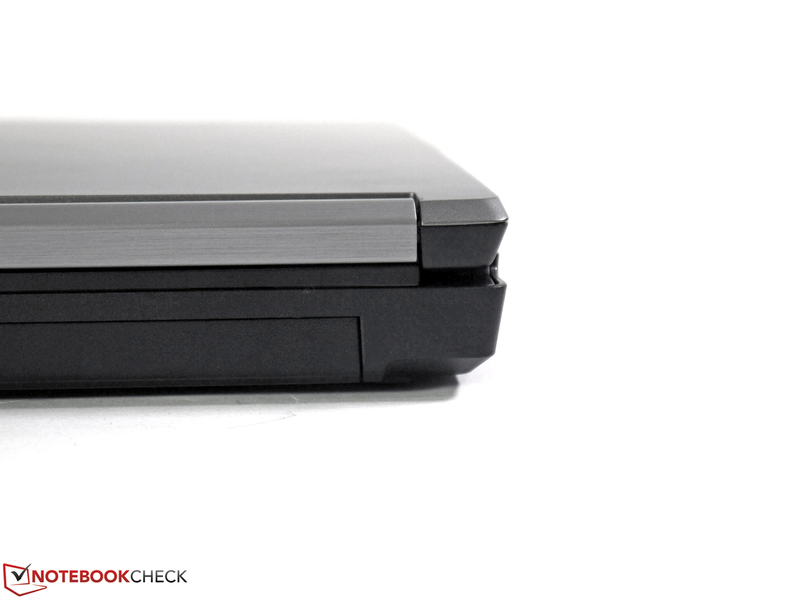 The fast SSD storage has a decent capacity, and ensures a good response in practice. Thanks to the Nvidia Optimus technology, you can use the integrated Intel HD Graphics as well as the Nvidia Quadro K1100M for demanding conversions or other GPGPU tasks. 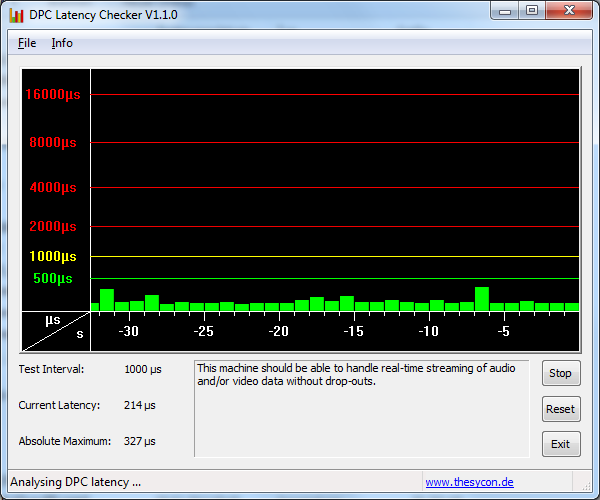 Intel's Quick Sync Video in particular, can result in significant performance benefits with certain video codecs. The PCMark 8 results show that the system configuration is very balanced and could only be noticeably improved with a faster processor or graphics card. PCMark 8 Home determined 3123 points with the integrated Intel HD Graphics 4600 and 3129 points with the Nvidia Quadro K1100M; the Work test determined a higher result of 4254 points for our system. You have the opportunity to partition the storage during the initial setup process. The recommended and default setting is a large system partition as well as the recovery partition (14 GB), but you can also create additional data partitions to realize a separation between the system and your files. However, we could use around 177 GB after the initial setup of our review unit, so multiple partitions might not be the best idea. 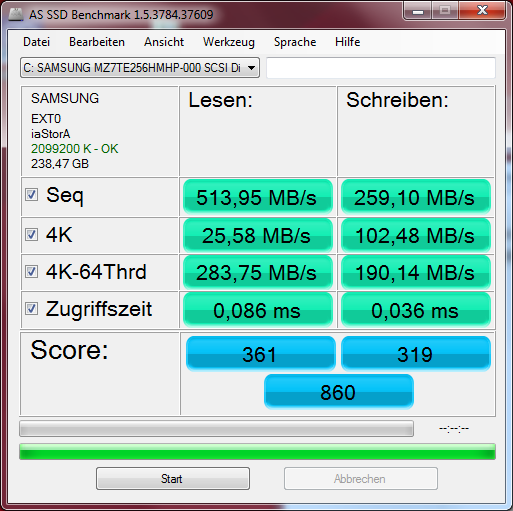 Otherwise, there is hardly any criticism for the fast SSD from Samsung. Data transfers are much faster compared to conventional hard drives with a sequential read performance of more than 500 MB/s and a write performance of almost 260 MB/s. Thanks to the extremely short access times, the system always responds quickly. 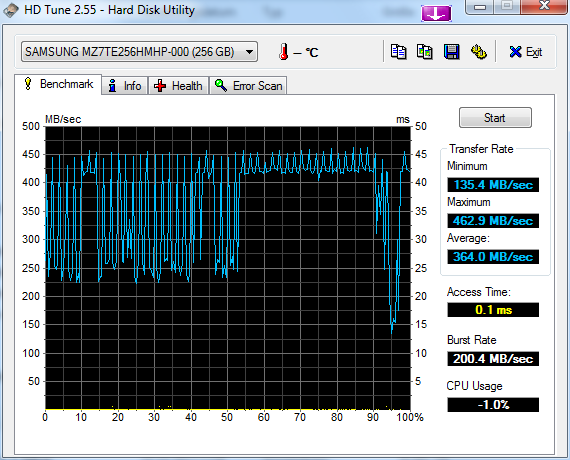 One small drawback is the 4K read performance (25 MB/s), which is much slower than the write performance (102 MB/s). Another criticism on a high level is the lack of an M.2 slot for very fast high-end PCIe SSDs that can increase the performance even further. 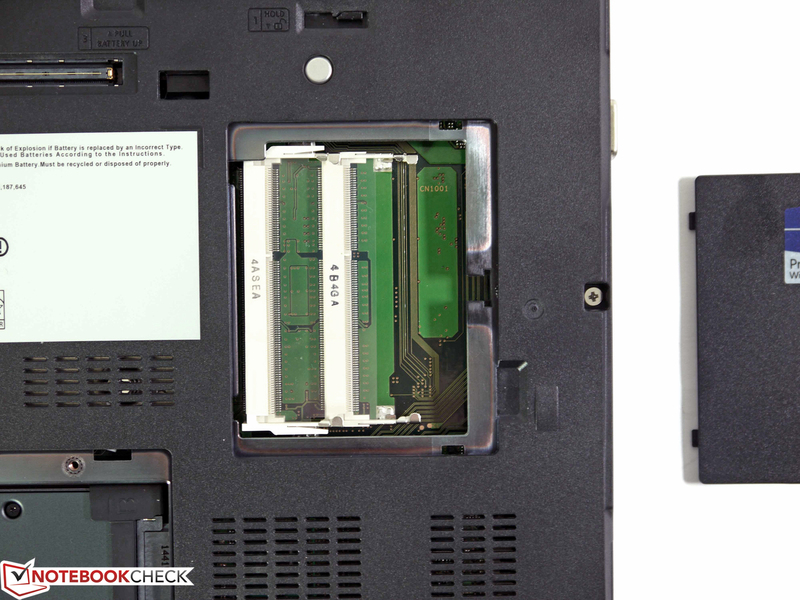 Fujitsu does not really expect you to upgrade or replace the 2.5-inch drive anyway (more on that in the Maintenance section), but you could complement the existing SSD with an adaptor for the multi-bay (S26391-F1334-L600, around 40 Euros; ~$45) that can be incorporated with any 2.5-inch drive. The Fujitsu Celsius H730 supports Nvidia's Optimus technology so you can also use the integrated Intel HD Graphics 4600 of the processor in addition to the dedicated Nvidia Quadro K1100M. The GPU driver can be set to handle the automatic switching between the GPUs, or you can change the settings based on your own preferences. This system is designed to select the best solution depending on the task and workload or in other words: Performance or economy. Nvidia's Quadro K1100M is often the entry-level solution for mobile workstations, only a few devices like the HP ZBook 15 or the Fujitsu Celsius H730 are also available with the weaker alternatives Nvidia Quadro K510M or Nvidia Quadro K610M. Both chips are basically just an emergency solution, especially if you work with demanding 3D tasks in the CAD environment. 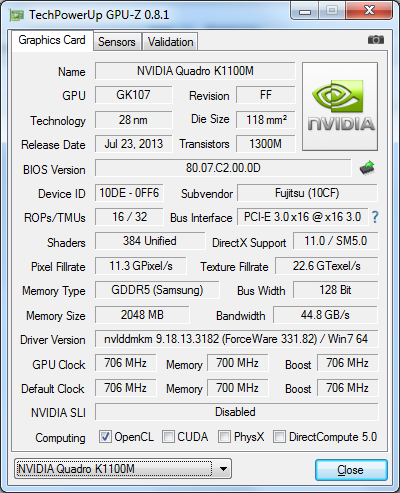 However, the Nvidia Quadro K1100M is not a really fast chip either. The GPU runs with a core clock of 705 MHz, 384 shader units as well as a 128-bit memory interface (2 GB GDDR5). The hardware specs are similar to Nvidia's consumer chips Geforce GT 740M and GT 745M. 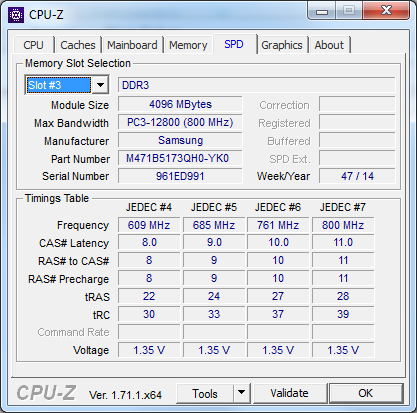 The latter two have a much higher core clock, but the DDR3 versions have a much lower memory clock. The great advantages of the professional card are the special BIOS and optimized drivers that enable a better performance, especially in OpenGL environments. This means that depending on the professional application, even very fast gaming GPUs can be beaten. 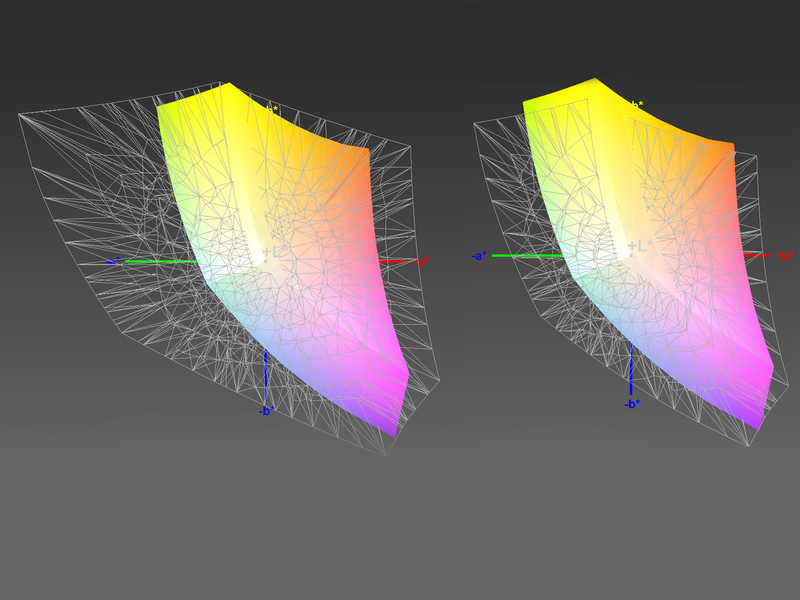 We use the benchmarks SPECviewperf 11 and 12 to evaluate the performance in professional 3D scenarios. These tests cover CAD, 3D visualization, oil and gas exploration as well as medical MRI. As usual, those benchmarks are only an indicator for the performance in certain scenarios. The actual software, the software version, the installed drivers and many more aspects can noticeably influence the actual performance. Compared to other Nvidia chips, we can see that the Quadro K1100M is unsurprisingly ranked between the Nvidia Quadro K610M and the Nvidia Quadro K2100M, but it is often beaten by the AMD FirePro W4170M or M5100 when we include the rivals from AMD. The K1100M is only faster in Catia, ProEngineer and TCVIS. The performance of the GPU is not that good with the usual consumer DX11 tasks either, where the comparatively slow hardware cannot be compensated with optimized drivers. 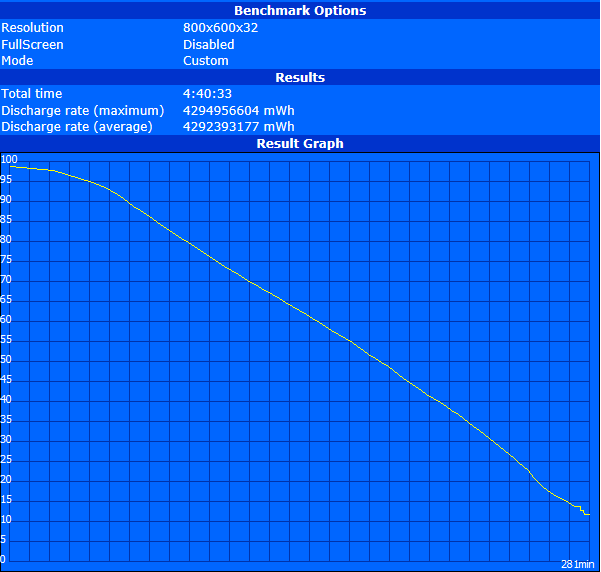 The current 3DMark, for example, determines 71943 points (Ice Storm) and 8600 points (Cloud Gate). 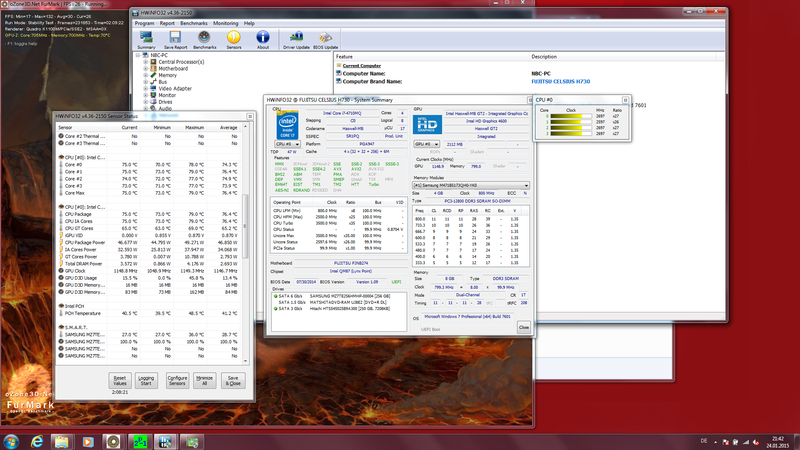 AMD's FirePro M5100 is much faster with 99576 points (Ice Storm) and 12526 points (Cloud Gate), respectively. Other comparisons are available in our comprehensive GPU benchmark list. GPGPU tasks are becoming more popular as well, but the Nvidia Quadro K1100M cannot really impress us in a direct comparison. Even the Intel HD Graphics 4600 is faster in Luxmark (Raytracing), for example. 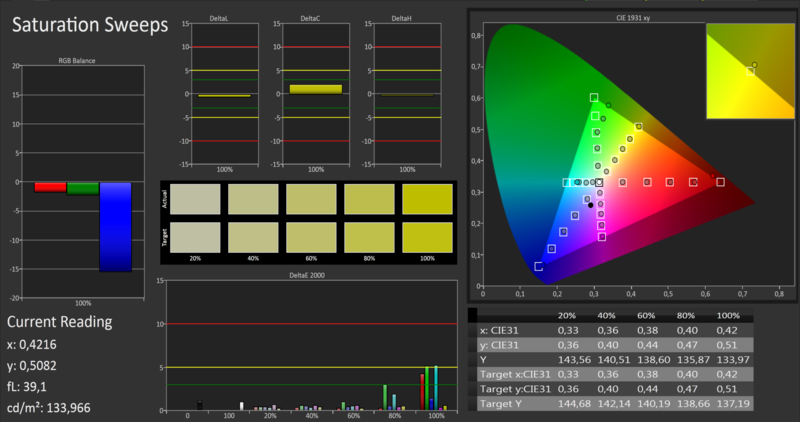 The Sala test results in 221 samples/s for the Nvidia Quadro K1100M and 267 samples/s for the Intel HD Graphics 4600. 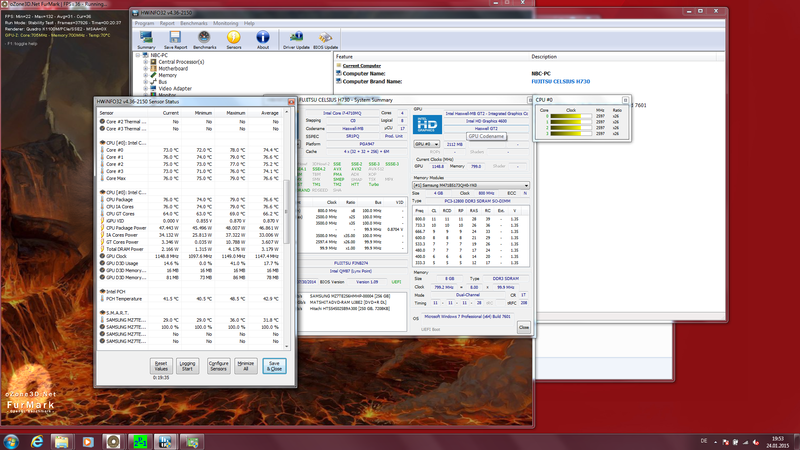 The AMD FirePro W4170M with 462 samples/s is almost twice as fast in this scenario . 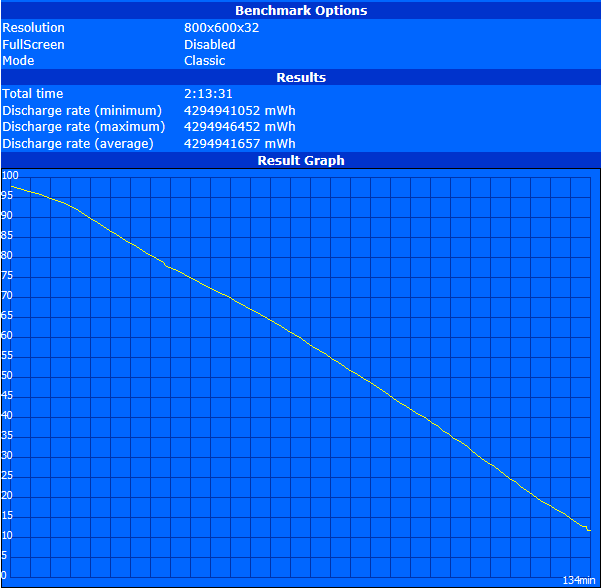 As with the CPU, you will have to live with a huge clock reduction on battery power. Cinebench R15 OpenGL Shading results in only 10.65 fps instead of 52.41 fps and Cinebench R11.5 only 9.69 fps instead of 44.68 fps, which means you can only use around 20% of the original performance on battery power. We could not find any settings to avoid or at least reduce the throttling. In general, mobile workstations are not designed for game play, but thanks to their dedicated graphics solutions, they usually manage decent results for the occasional gaming session. 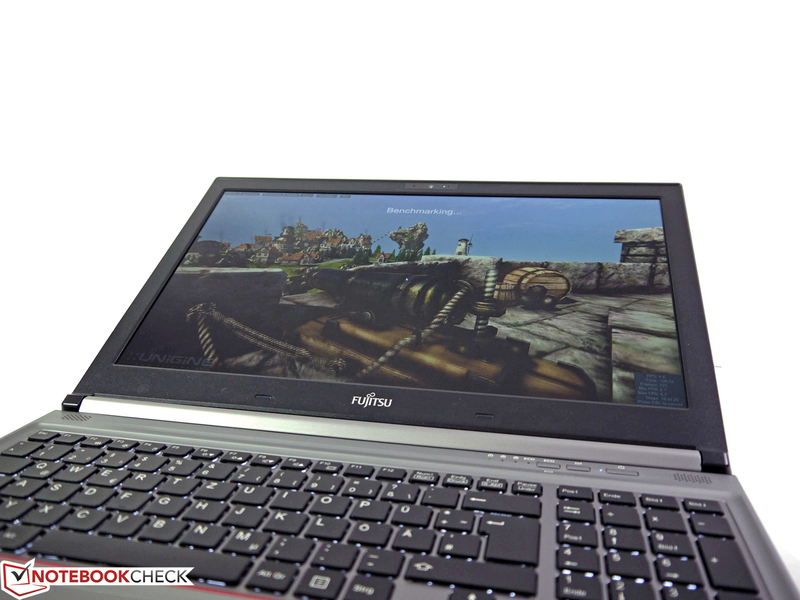 We have already tested numerous games on the Dell Precision M3800 and the resulting frame rates can be transferred to the Fujitsu Celsius H730 with the Nvidia Quadro K1100M. New additions are “Thief” as well as “GRID: Autosport”. While “GRID” still runs quite well with high settings, it is almost impossible to play “Thief” even with medium settings. As with the Nvidia Geforce GT 745M, the frame rates are usually sufficient for medium and sometimes high details, only very hardware-demanding games like “Company of Heroes” are hardly playable. Workstations are usually quite busy and often have to handle medium to high workloads. If this is not the case, the Celsius H730 is almost inaudible. The fan is running at its lowest setting, the SSD is silent and there are no other noise sources. The situation changes under load and the cooling solution is clearly audible with up to 44.9 dB(A) and even 48.4 dB(A) under maximum load. This is actually borderline for a working environment and could be annoying or even stressful for some users after a few minutes. The noise characteristics are at least quite restrained and you can only hear a sonorous murmur. High-frequency noises, a pulsating fan or sudden changes of the fan speed are not a problem for the review unit. As with the system noise, the temperature development depends on the current workload. The case is quite cool and we can measure up to 37 °C (~99 °F) at the bottom with light workloads. More demanding tasks result in a higher temperature at some points, especially at the rear fan exhaust with up to 47 °C (~117 °F). However, these temperatures are not critical by any means. On the contrary: Large parts of the chassis including the area around the keyboard are actually a few degrees cooler compared to low system load. This is a result of the fast rotating fan that also limits the temperatures to 38 to 43.2 °C (~100 to 110 °F) on the bottom. 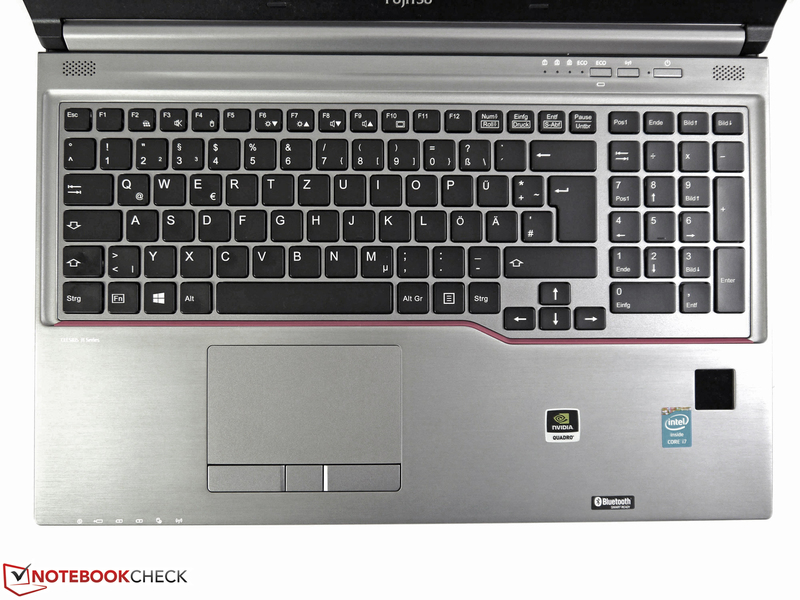 The internal temperatures of our tested Fujitsu Celsius H730 also leave a very good impression so there should not be any problems when you use the device permanently. 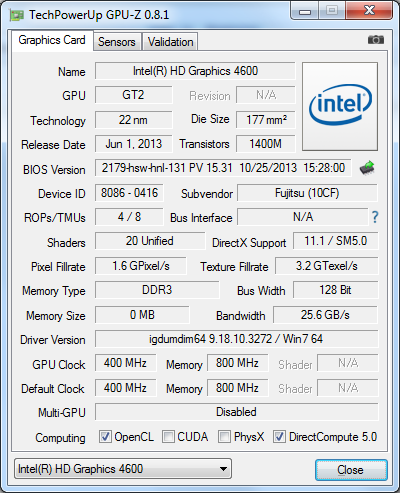 According to the tool HWInfo, the two-hour stress test did not result in CPU or GPU temperatures above 80 °C (~176 °F). We have already mentioned that the fan is quite active in this case, but it keeps the components very cool. The speakers are located between the keyboard and the display on the left and right side, and produce a stereo sound that puts too much emphasis on the high tones. Medium tones and bass are hardly noticeable or not available at all. The volume can be adjusted in 26 steps. The maximum volume is quite low and only sufficient for presentations in a small circle. 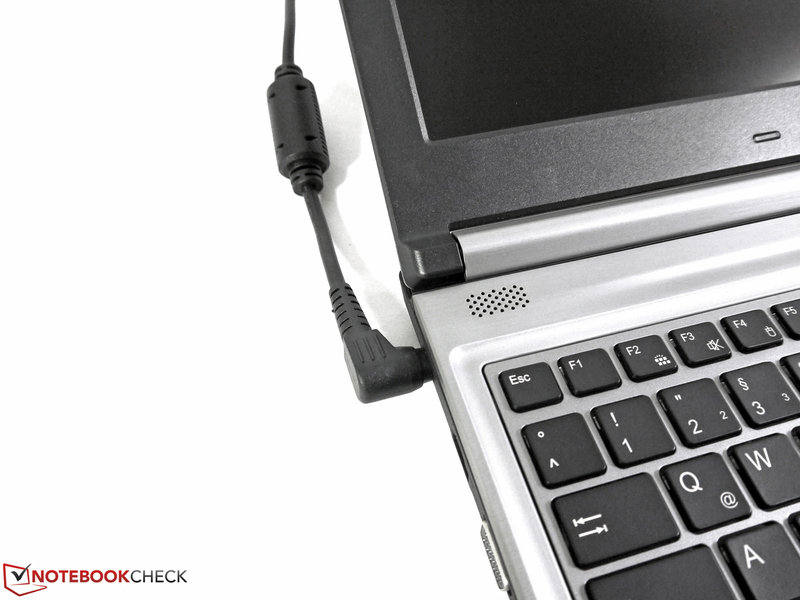 You get separate ports for headphones and microphones; Fujitsu has forgone a combined stereo jack so you can use multiple devices simultaneously. The power consumption of the system benefits from the comparatively frugal components and the Nvidia Optimus technology. Intel's frugal CPU graphics is powerful enough for many tasks and can reduce the overall consumption significantly when you do not use demanding 3D applications. While idling, we measured a minimum value of 13.5 Watts (Intel, minimum display brightness, energy-saving mode) and a maximum value of 17.9 Watts (Nvidia, maximum display brightness, high-performance mode, all wireless modules active). The minimum consumption can be reduced to 11.9 Watts when the display is turned off. We simulate medium workloads with 3DMark 06. The result is a maximum consumption of 65 Watts with the maximum display brightness and activated wireless modules. 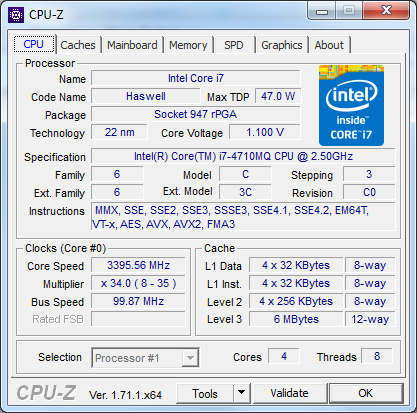 Maximum load results in a maximum consumption of 103.9 Watts for a short time before it drops to 94.5 Watts when the CPU clock levels off at 2.6 GHz. The power adaptor has a nominal output of 150 Watts, so there is a lot of headroom for our review configuration. It is quite large and bulky with a weight of almost 1 kg (~2.2 lb), but the temperature is also much lower than some of the rivals with just 41 °C (~105.8 °F). The 72 Wh battery should be able to deliver good battery runtimes, but Fujitsu has limited the maximum discharge to 11% to protect the battery. 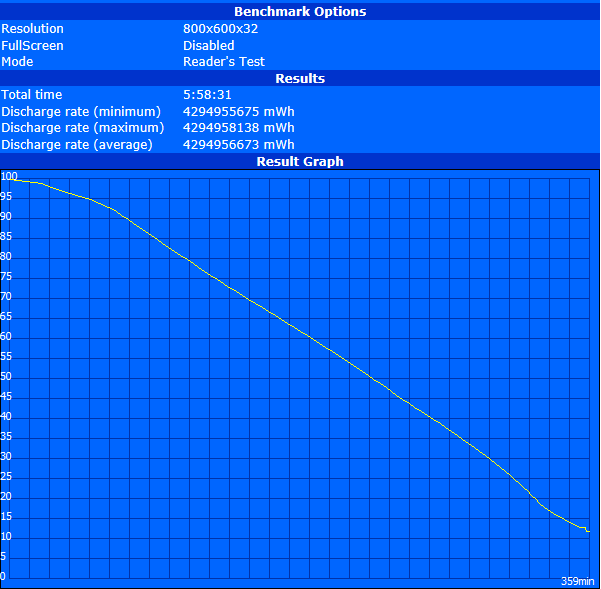 This means the test results are lower compared to our standard test settings (discharge to 3%). The Battery Eater Reader's Test (maximum runtime, minimum display brightness, Intel GPU, all wireless modules turned off) determines a runtime of almost 6 hours for our review unit. 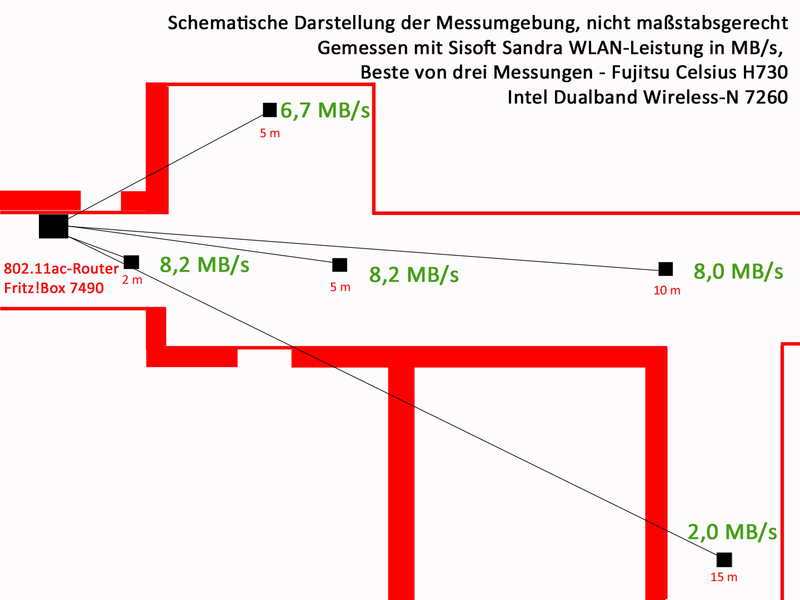 Our more realistic WLAN test (energy-saving mode, Intel GPU, brightness at 150 cd/m²) runs for 4:41 hours and video playback (energy-saving mode, Intel GPU, brightness at 150 cd/m², WLAN off) is possible for around 4 hours. The Battery Eater Classic Test (maximum luminance, Nvidia GPU, wireless modules active, high-performance profile) runs for a comparatively long time and really benefits from the throttled performance on battery power. The runtime is more than two hours with a remaining battery capacity of 11%. Fujitsu can still do it. 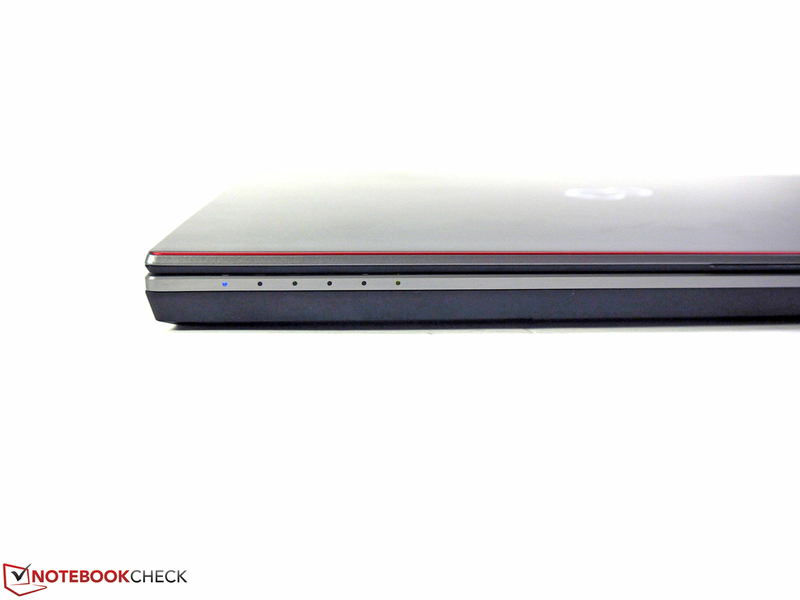 The Fujitsu Celsius H730 is a balanced mobile workstation in all aspects and delivers good results in every section. You cannot find any big drawbacks or reasons why you would not buy the device, so the review unit can take a top spot in our ranking for workstations. We still think there are some aspects that can be improved. Some current ports are missing, the maintainability for the user is not very good and some potential buyers might want to see alternative display options, especially since the available Full HD panel cannot completely impress us in all areas. 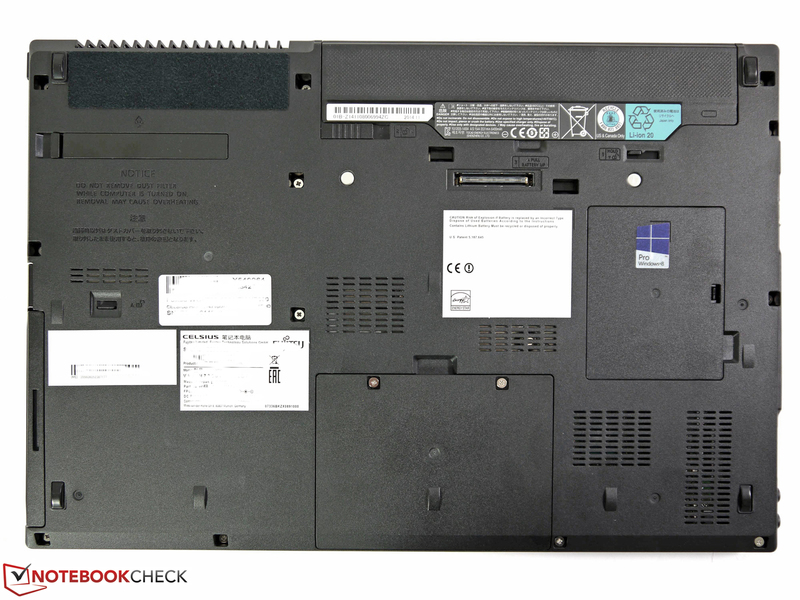 However, the Fujitsu Celsius H730 also offers some interesting, unique features like the optional multi-bay battery or the inspection flap for the cooling system. The mobile workstation can impress with basic features like the overall solid chassis, the very good input devices, the good system performance and mobile characteristics. We also want to mention the effective cooling solution that is designed for permanent workloads and it can prevent throttling of the components very effectively. However, you will have to live with a compromise in the form of an unpleasant system noise when you stress the Fujitsu Celsius H730. The current street price of our review configuration is comparatively moderate at 1600 Euros (~$1807), which – together with the three-year warranty – might be an important factor when you want to buy a mobile workstation. 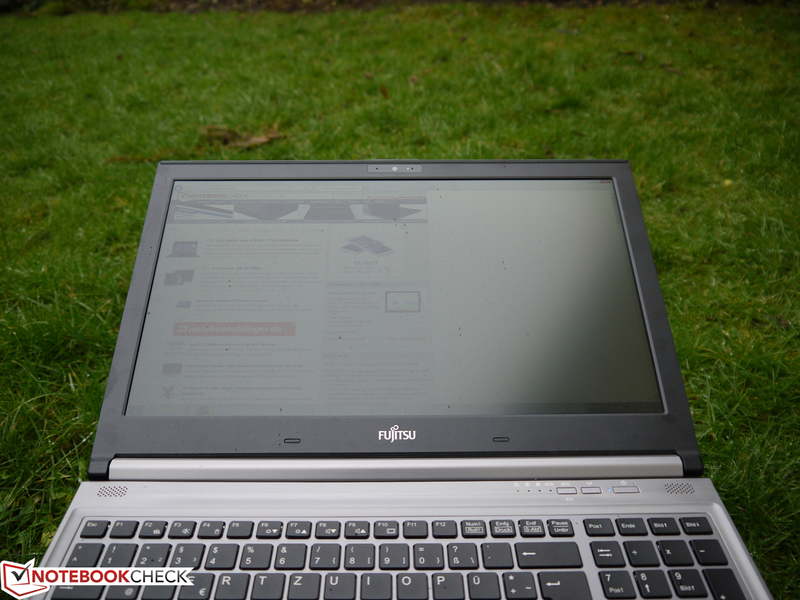 In Review: Fujitsu Celsius H730. Test model courtesy of Fujitsu Germany. 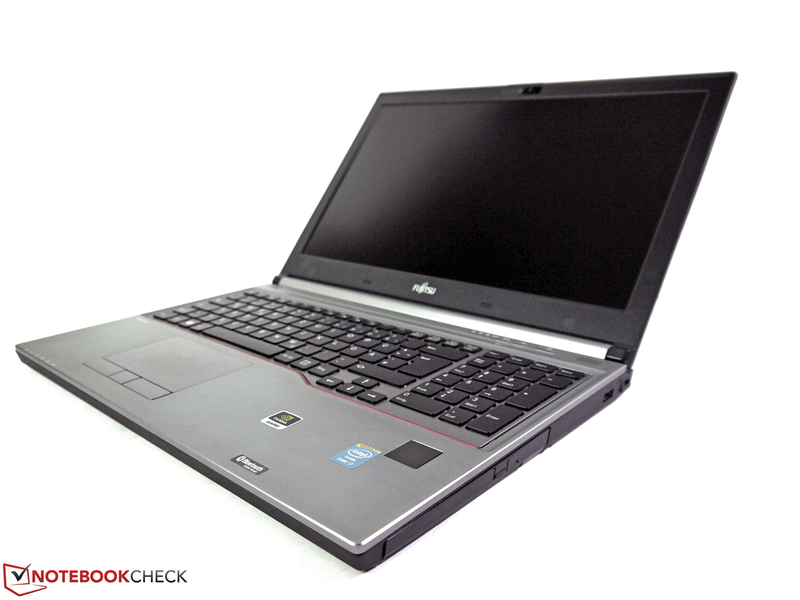 The Fujitsu Celsius H730 is a 15-inch mobile workstation. ... long warranty periods and high-quality components. ... thanks to the slim silhouette. 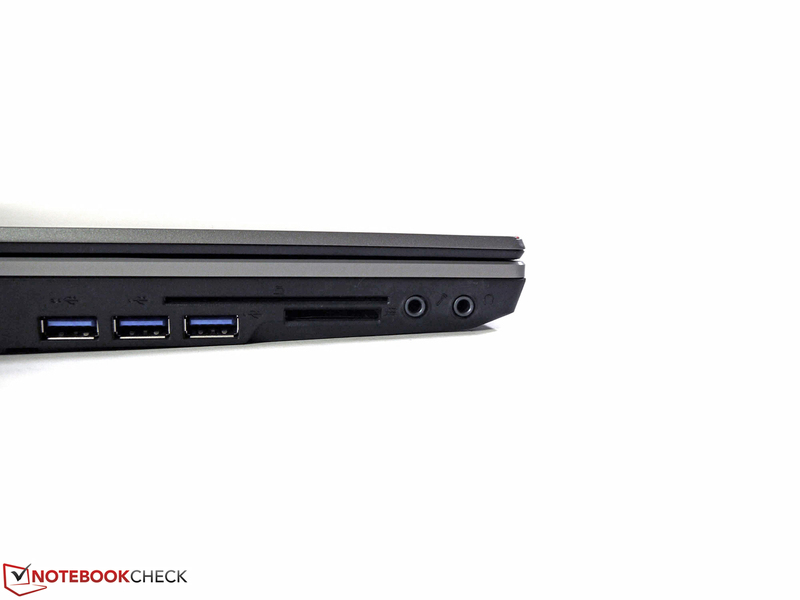 It is convenient that the usual ports and expandability options are still available. ... but suffers from a low brightness with vertical shifts of the viewing angle. ... as the security features to protect your personal files. The Fujitsu Celsius H730 still has an optical drive, even though they are pretty rare nowadays. You also get a real USB 2.0 port, which is primarily designed for slow peripherals. ... but there are sometimes uneven gaps when you have a closer look. 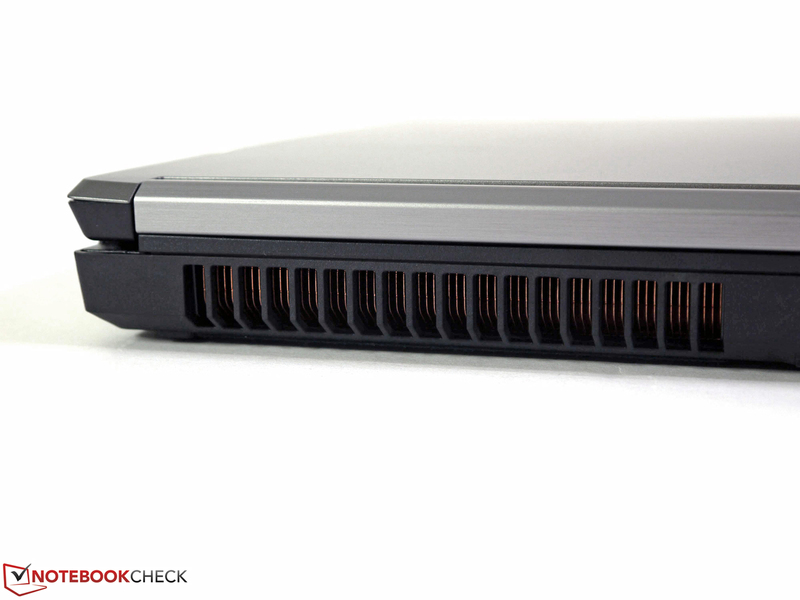 The cooling solution at the back is loud under load, but also ensures low temperatures. The majority of ports is at the left side, so it can be a bit crowded. 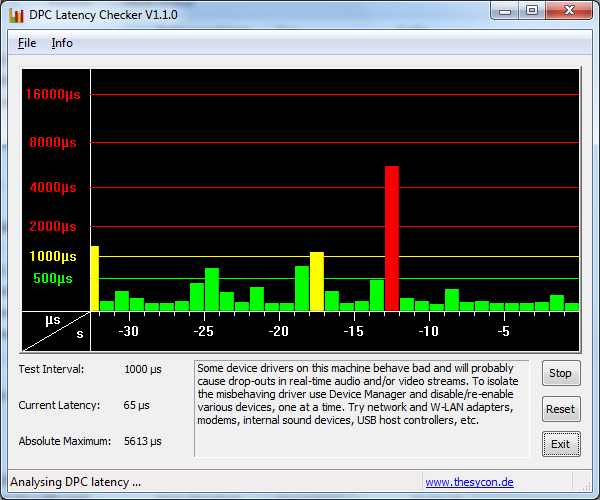 The card reader is attached via fast interface and managed up to 88 MB/s (read, UHS-I) in our test. 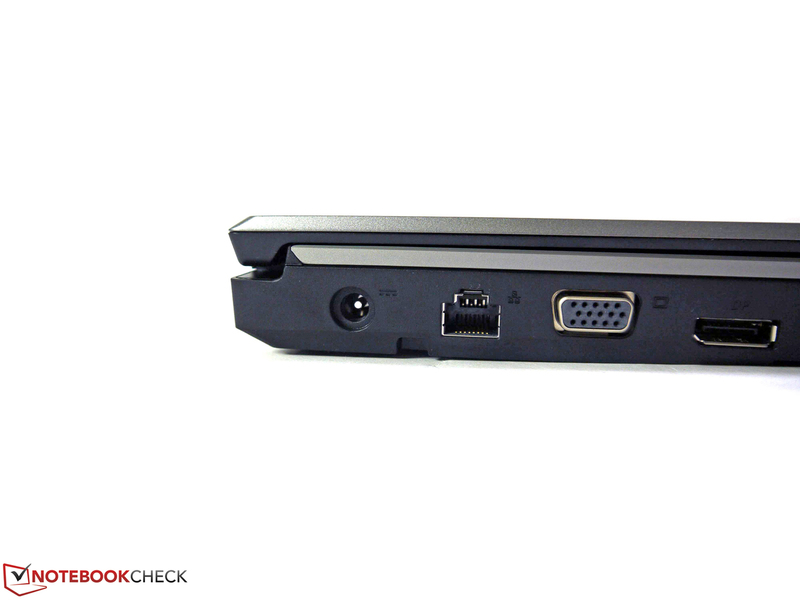 Besides a digital DisplayPort you can also use an analog VGA port to attach external displays. The status LEDs at the front are pretty restrained and not annoying in dark environments. At the bottom are several maintenance hatches that are easy to remove. The Solid State Drive from Samsung has a gross capacity of 256 GB and convinces with good performance results. Thanks to the quad-core CPU, the review unit still has two empty memory slots. 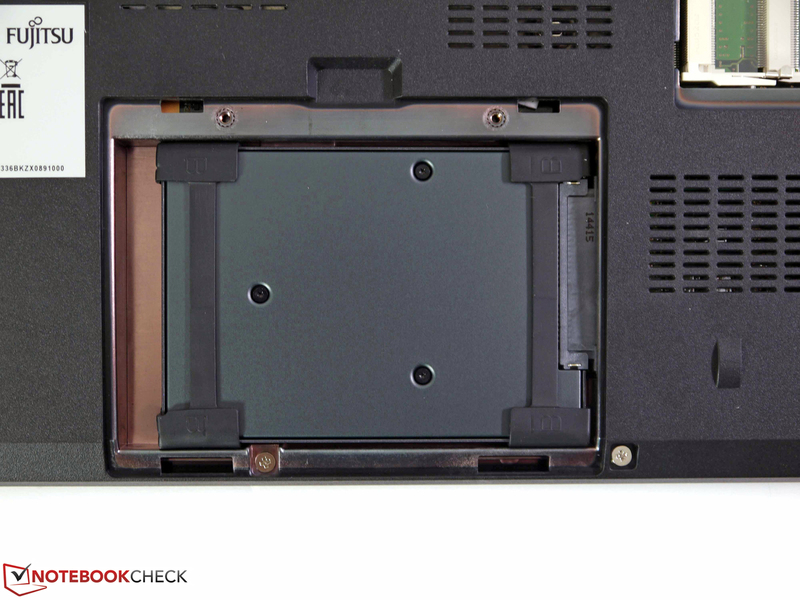 A unique feature of the Fujitsu Celsius H730 is the inspection flap for the cooling solution. 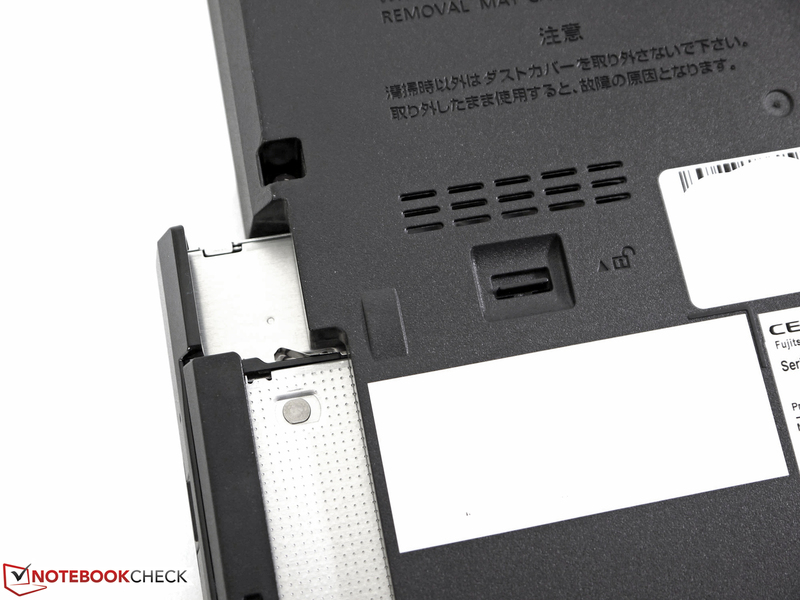 The docking port can be used to attach the corresponding port replicators from Fujitsu. Thanks to the modular multi-bay it is easy to replace drives. Another pleasant unique feature is the modular secondary battery. The provided standard battery has a capacity of 72 Wh and is sufficient for around 4 hours. The battery is flush with the chassis and sits firmly in the intended spot. 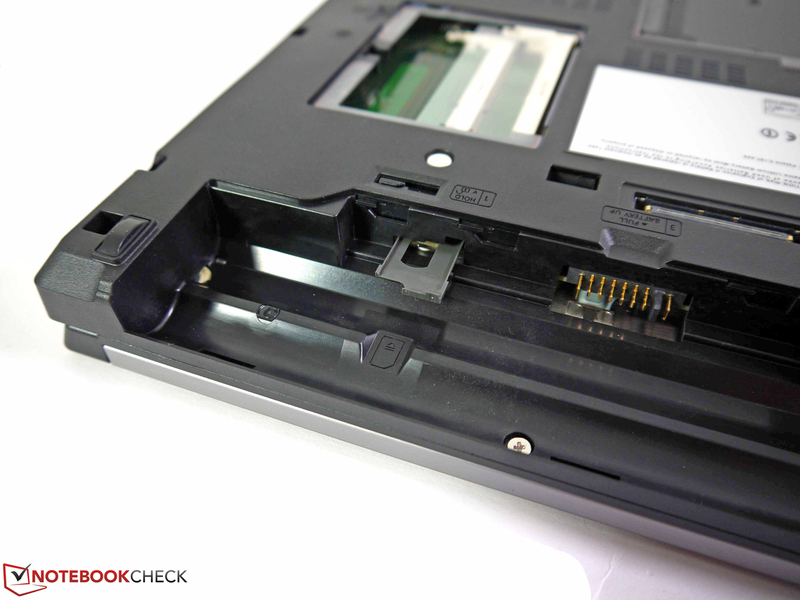 The battery slot accommodates the extendable SIM slot for the UMTS module. 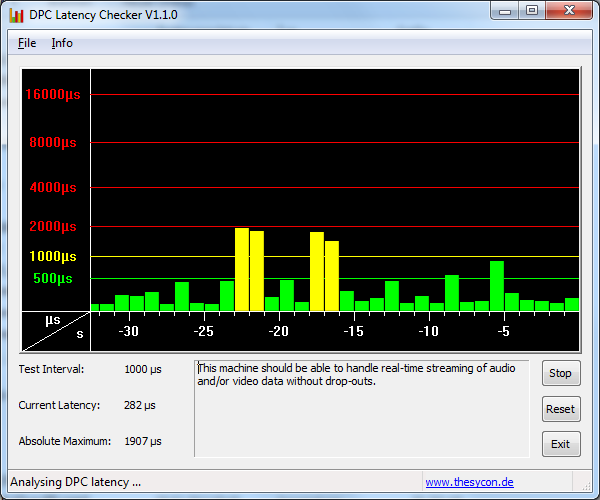 Our test showed a good signal quality with two separate antennas. The power adaptor is not only big and bulky, but also heavy with a weight of almost 1 kg. The specified nominal output on the other hand is pretty low with 150 Watts. The angled power cord can be directed towards the rear of the device and therefore reduce possible cable collisions. The good overall performance without real drawbacks. Unique features like the multi-bay battery or the slot for the fan filter could be important for some users. If there is just one display, it should be pretty good, especially in a workstation. 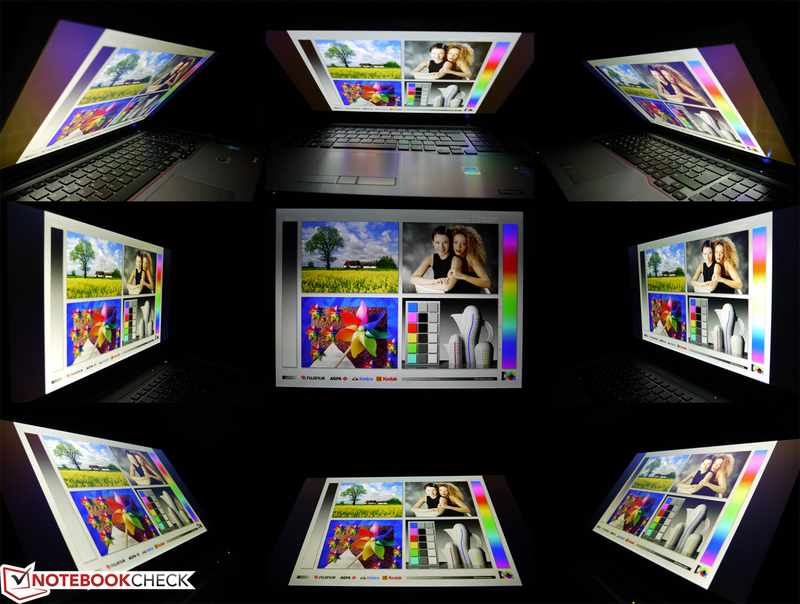 Color space, brightness distribution and the brightness changes when you change the viewing angle are not really convenient and could be a problem for potential buyers. That Fujitsu does not offer other mobile workstations. 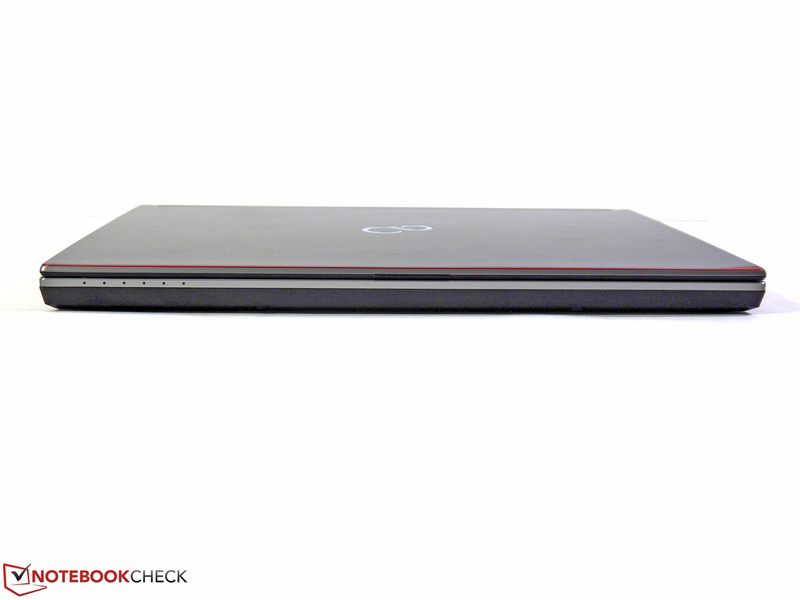 Neither a 17-inch workstation nor the currently popular slim-line versions are available.